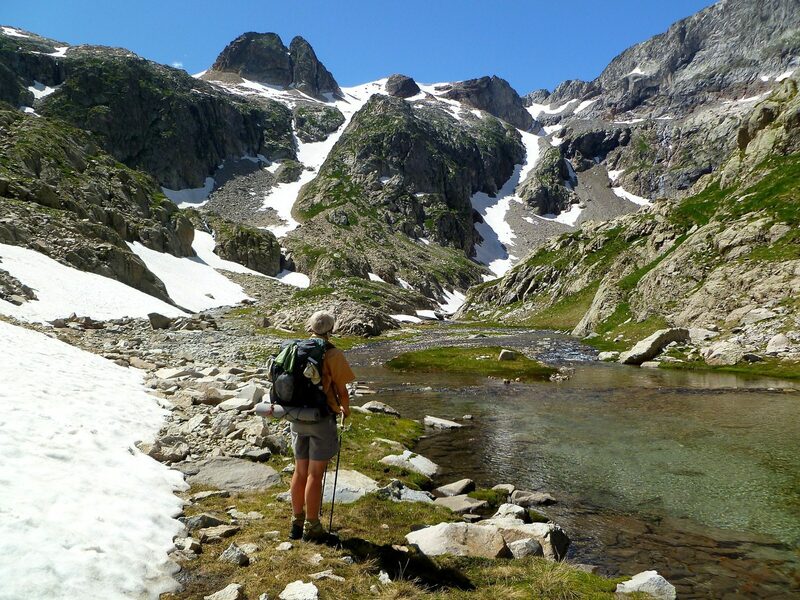 What: thru-hike of the Haute Route Pyrenees (HRP). Where: The border between France and Spain, from the Atlantic to the Mediterranean. When: July 8 – August 11, 2010 (35 days). 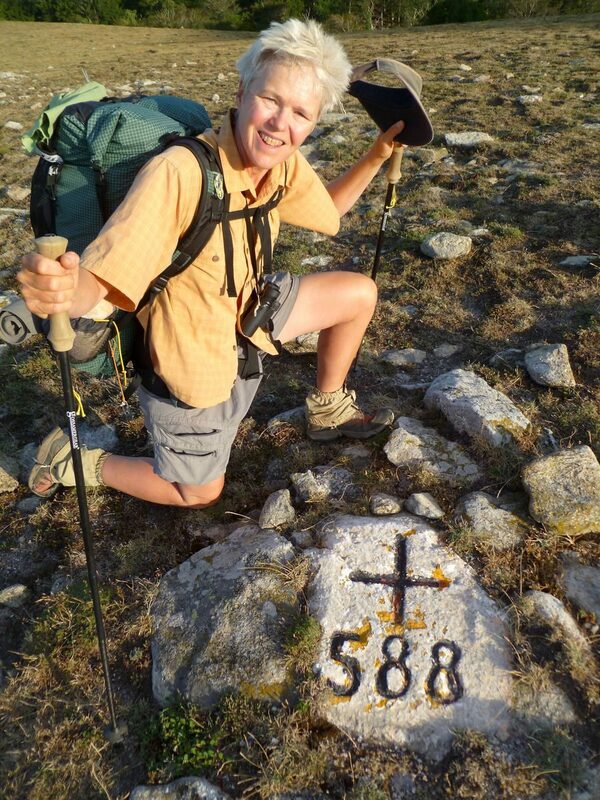 Bonus Post-HRP: August 12 – August 20, (9 days); 115 miles of coastal hiking in France and Spain. 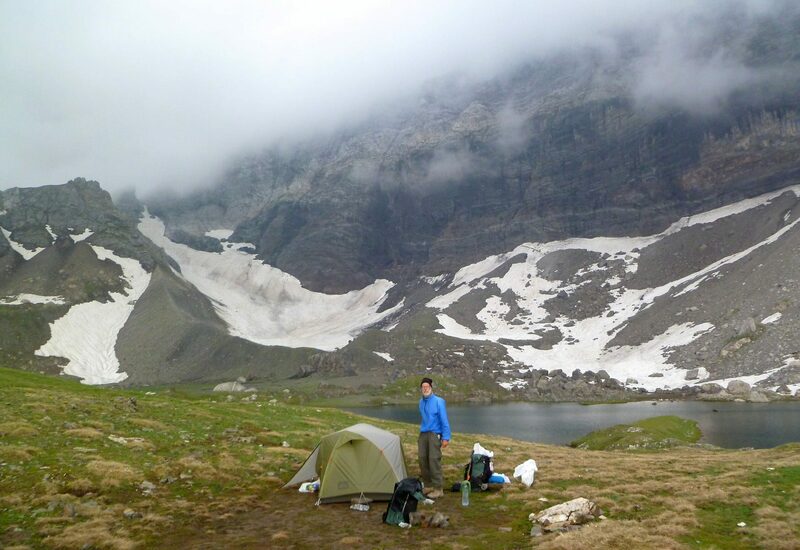 Highlights: fabulous and diverse scenery; five-star campsites; challenging route; good meals at refuges. 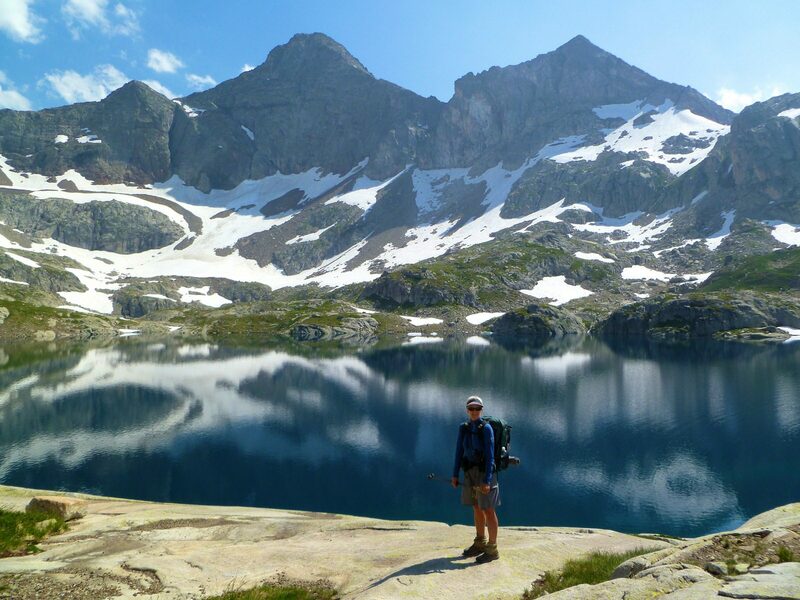 We like to hike in regions we have never visited and had already walked extensively in the U.K. and northern France, but not in the Alps or the Pyrenees. 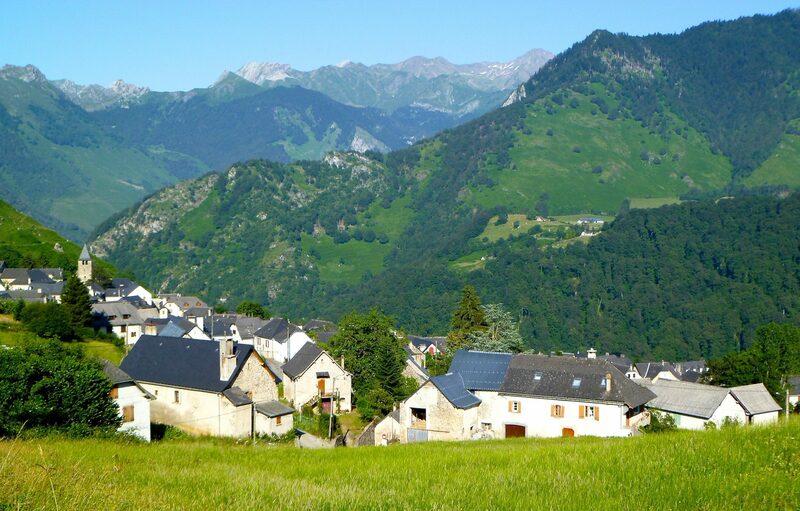 A French friend familiar with both ranges highly recommended the Pyrenees as very beautiful, less crowded, and less regulated than the Alps. Our optimal hike is four to six weeks long. In unfamiliar places, we prefer routes that are defined and documented so we don’t have to spend too much time researching and planning. The HRP perfectly matched all of our criteria. We followed the route described in the Pyrenean Haute Route, by Ton Joosten, published by Cicerone Press: 2004 edition. 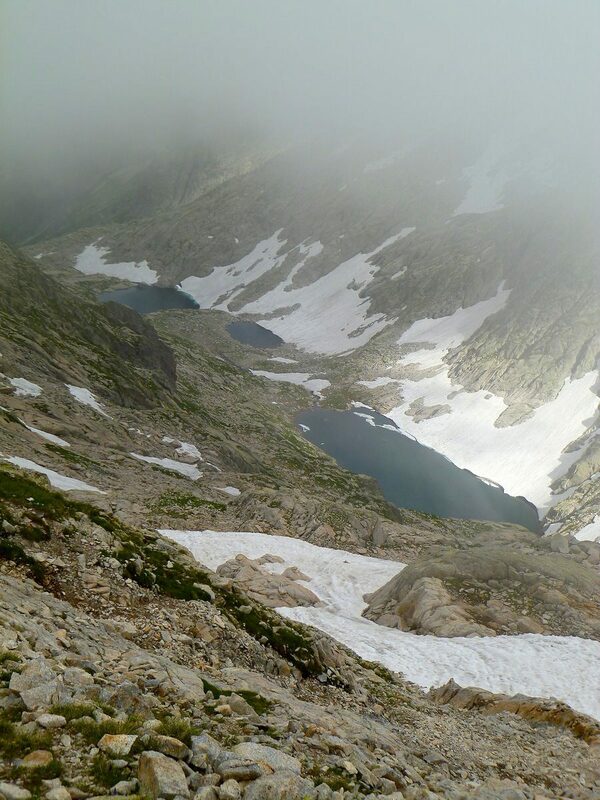 Pyrenean High Route, written by a Spanish long distance hiker. 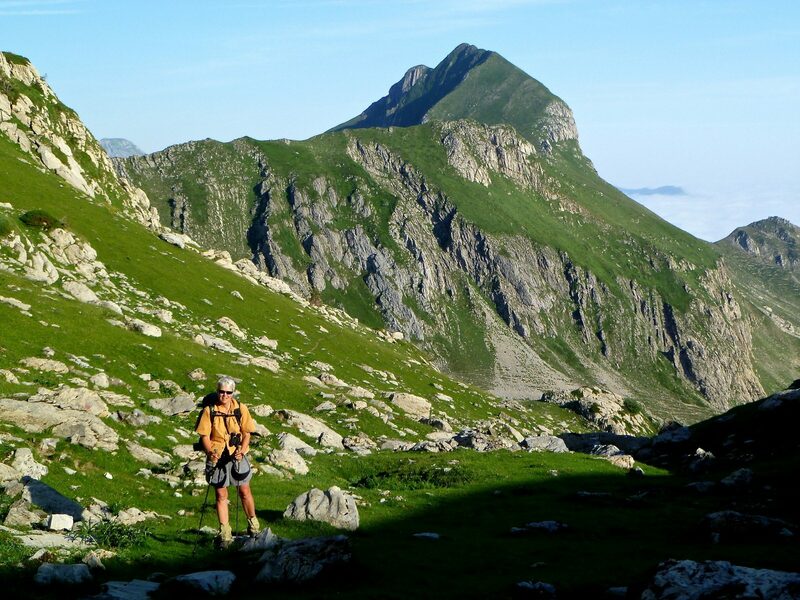 Mountain Magic on the Pyrenean High Route, by David McClure. Roger Caffin’s description of the GR10 and GR11. 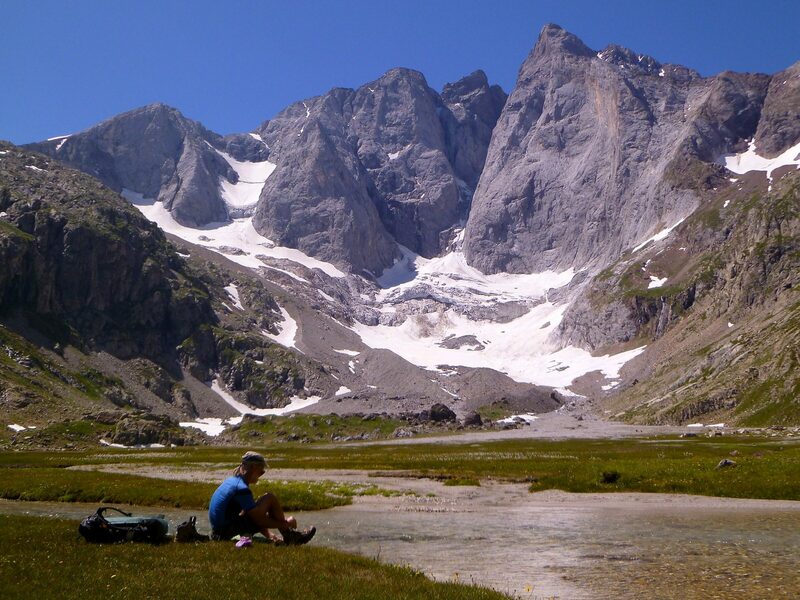 Steve Cracknell’s excellent site Trekking the Pyrenees: GR10, GR11 or HRP; a short guide to the differences. Dawn on day 1. 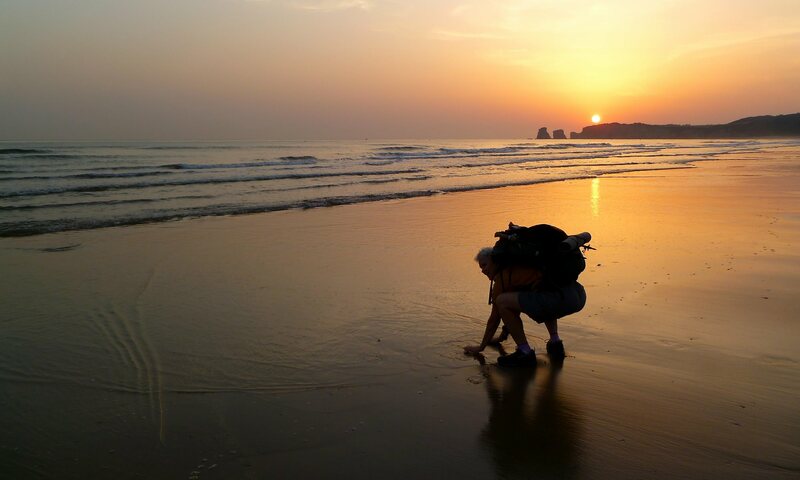 The HRP hike starts with the ritualistic dip in the Atlantic Ocean at Hendaye. 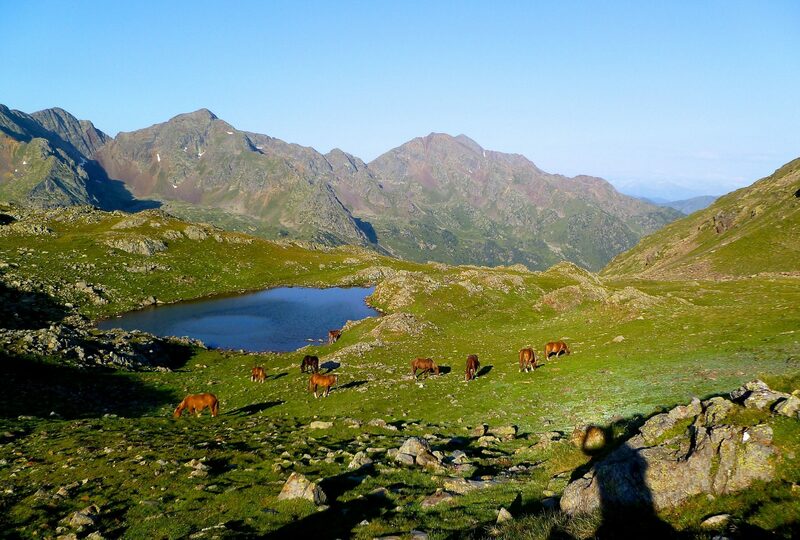 Grazing cows, along with sheep and horses are found throughout the Pyrenees from low alititudes to high mountain meadows. Dinner #2. 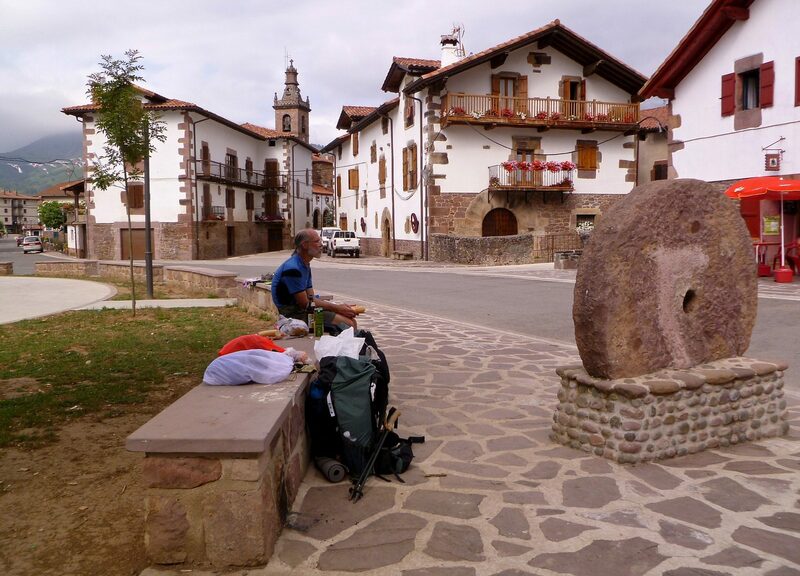 At the town fountain in a small Basque village of Arzikun, Spain. . The HRP frequently crosses back and forth across the French/Spanish border. Camp#2. Beautiful flat hilltop overlooking the village of Arzikun. ~500 meters. 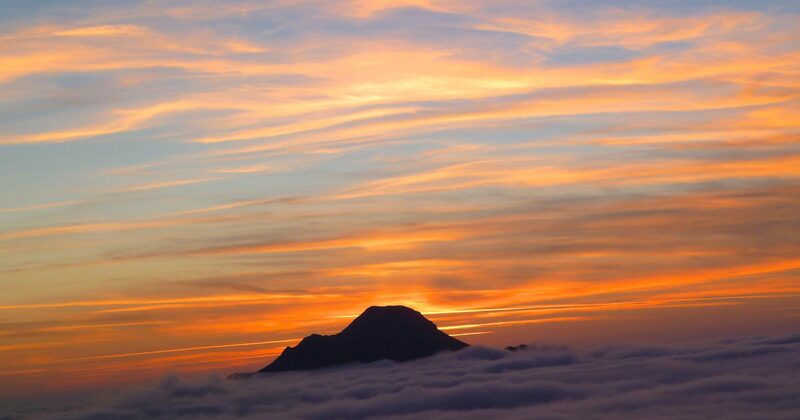 Early the next morning and fog had arrived in the lowlands of Spain. We frequently had fog below us and sometimes we were in it as well. The French side was usually much more prone to fog than was Spain. Morning fog again. The small red and white striped post at Amy’s feet is a GR trail marker. The white over red tag is used for all GR routes (Grand Randonee long distance routes) in all of France and Spain. Day #4. 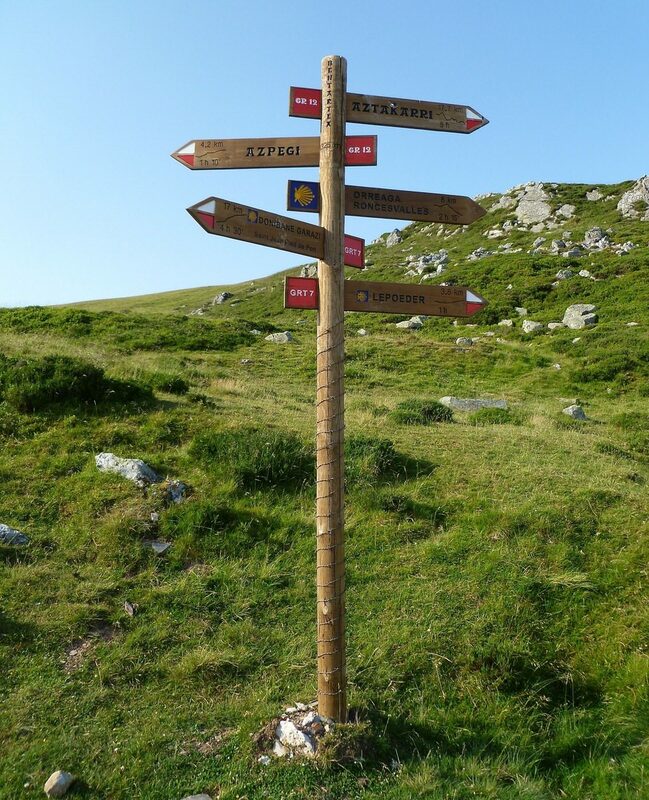 A signpost above Roncesvalles, Basque country; here the HRP is briefly concurrent the Way of St. James, a historic pilgrim route that ends at Campostuello, Spain. The way of St James uses the yellow shell on a blue background symbol. Basque Country has an extensive network of well marked paths. Climbing on a faint path out of a deep valley. The route never hesitated to gain or lose alititude and we spent most of the trip walking either uphill or downhill. Day #5. Walking the ridge line, still foggy on the French side late in the afternoon. In spite of the fog, the weather was really hot and Jim used his Chrome-Dome for shade. Camp #5. Fantastic perch with views of the distant high mountains ahead of us to the east. 5 star campsite. Sunset from Camp#5. Pic d’Orhy in the distance. Sheep, cows, horses graze everywhere. Day #6. The transition from hilly landscape to more dramatic mountains. Lescun, France. We used the 2004 edition of the Cicerone Press guide by Tom Joosten. He breaks the HRP into 42 steps, organized into five stages, each ending at a town with a shop. Lescun is the end of the first stage. We ate dinner #6 at a restaurant in town, and bought food for the next six days. Morning fog in France. The mountains are getting more dramatic. The building is a shepherd’s hut. Dinner #7. 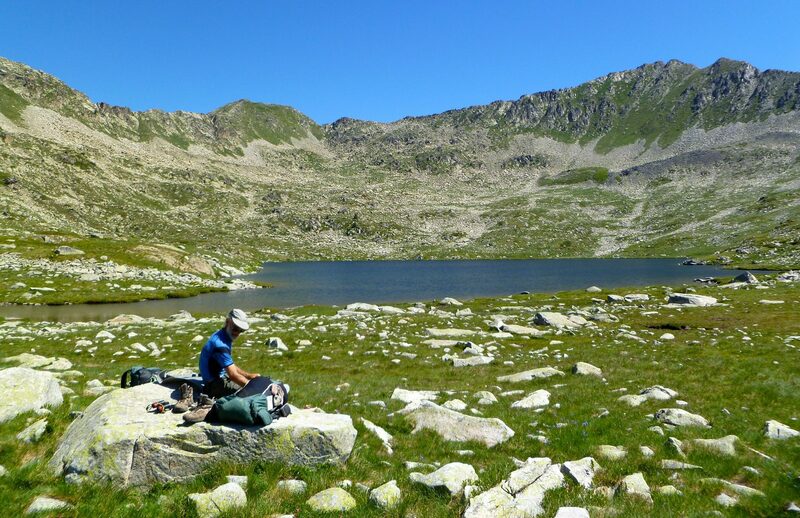 A five star dinner site, about 90 minute walk east of Refuge d’Arlet (which was not serving food when we passed it). We ate high on the ridge with a fantastic view. After dinner we dropped down into the foggy valley below to find a flat place for the tent. Day #8 is I think, the 8th consecutive day of dense fog below us on the French side of the border. 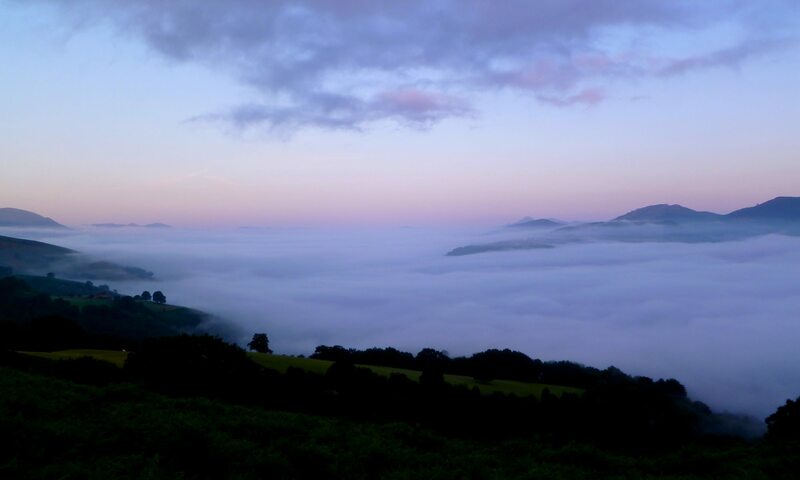 We were nearly always above the fog though. 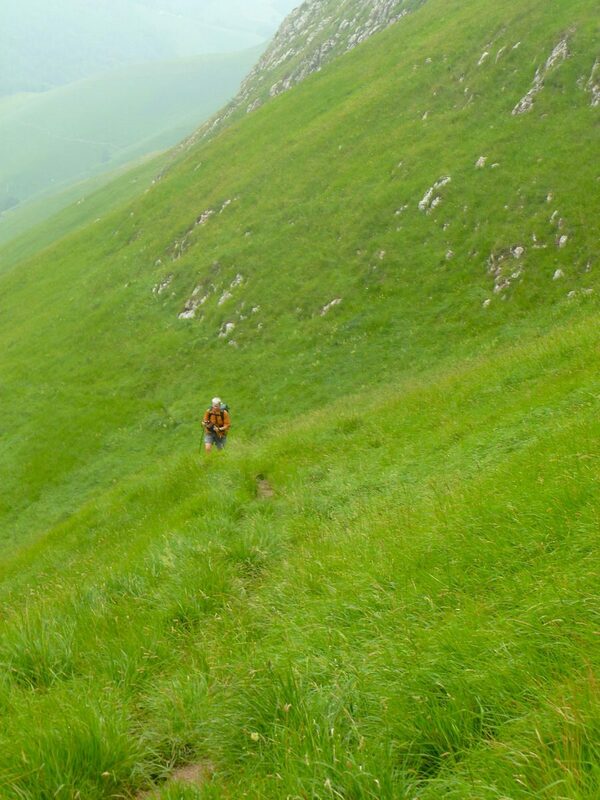 Some of the route is on well worn trails, but much of it is on paths like the one Jim is walking on here. We crossed a col that has a road and a ski resort, Candanchu. A weird place mostly deserted in the summer. 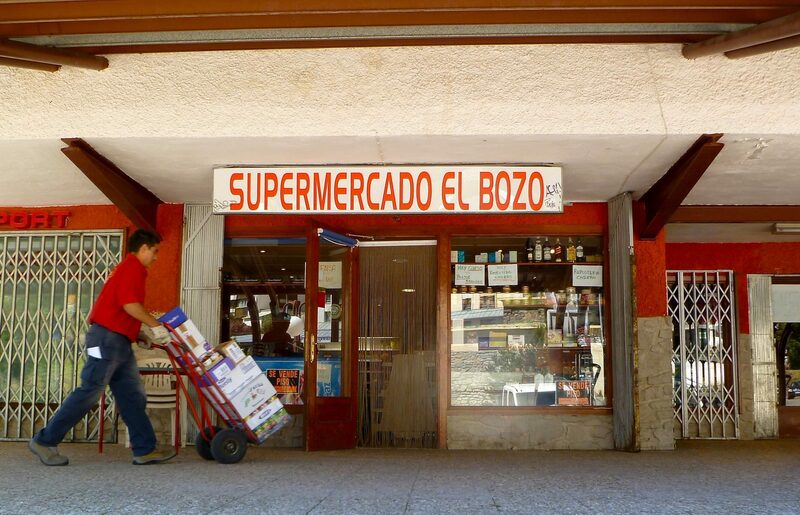 Fortunately, the tiny El Bozo stays open all year and we were able to buy food for ~5 days, enough to last until the next shop. Then we ate Lunch #8 at the small bar/restaurant across the street, where we learned that Argentina had just approved gay marriage (first Latin American country). We celebrated that with the friendly Argentine proprietor. This section of trail was above a very exposed drop-off. The fixed cable was critical to safety. Dinner #9. 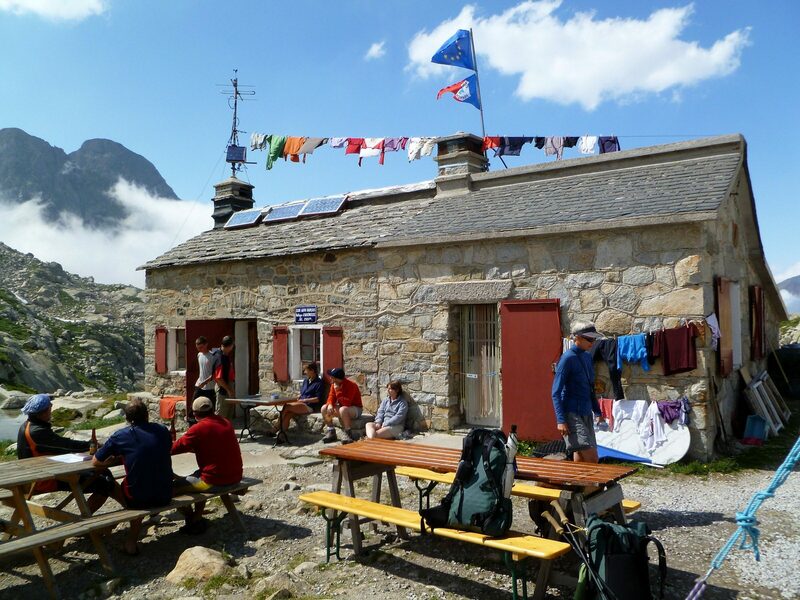 Yummie late afternoon omelettes at a staffed Refuge d’Arremoulit, 2305 meters. The refuges all have fixed menu dinners served at ~7:30. But during the day we were usually able to order omlettes or sandwiches. Getting dinner at a refuge meant camping nearby as dinner wasn’t over until almost dark. The campsites here were rocky, not level, and crowded. View from Refuge d’Arremoulit. Left the refuge ~6PM to find a good place to camp. Turned out the next viable campsite on our route was two passes away, 3 hours walk, but we didn’t know that at the time. Too many rocks! We encountered our first serious snow of the trip on day #9, 45 minutes above Refuge d’Arremoulit, climbing up to Col du Palas at 2517 meters. 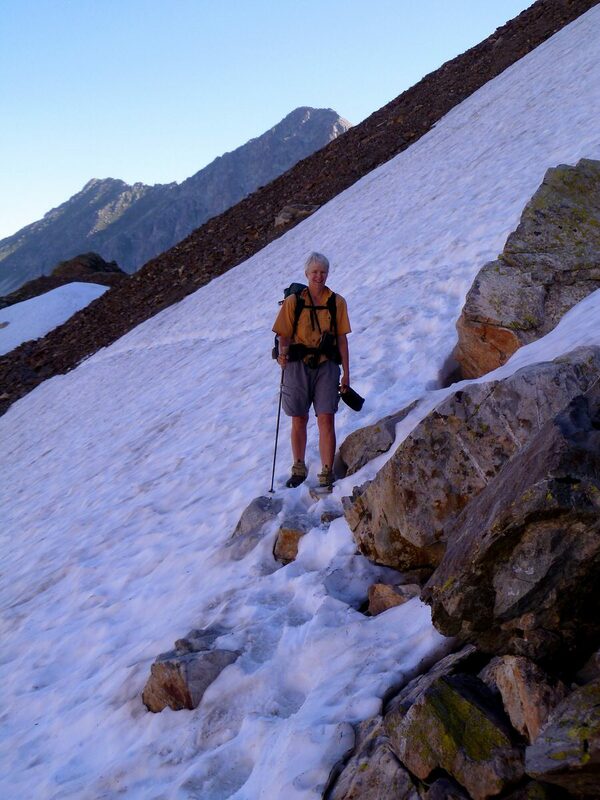 It was a long snowfield, but not so steep as to be hazardous. 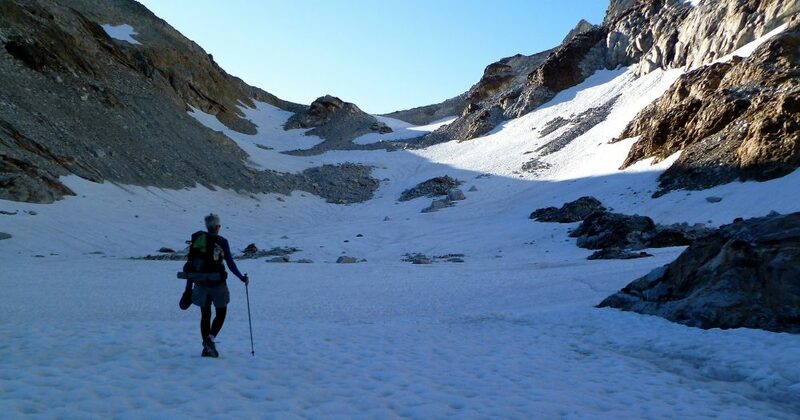 In order to have lighter packs, we did not carry crampons or ice axes. Snow extent varies year to year, and snow conditions vary day to day (icy vs soft), so we didn’t really know if we’d be able to follow the primary HRP across every pass. 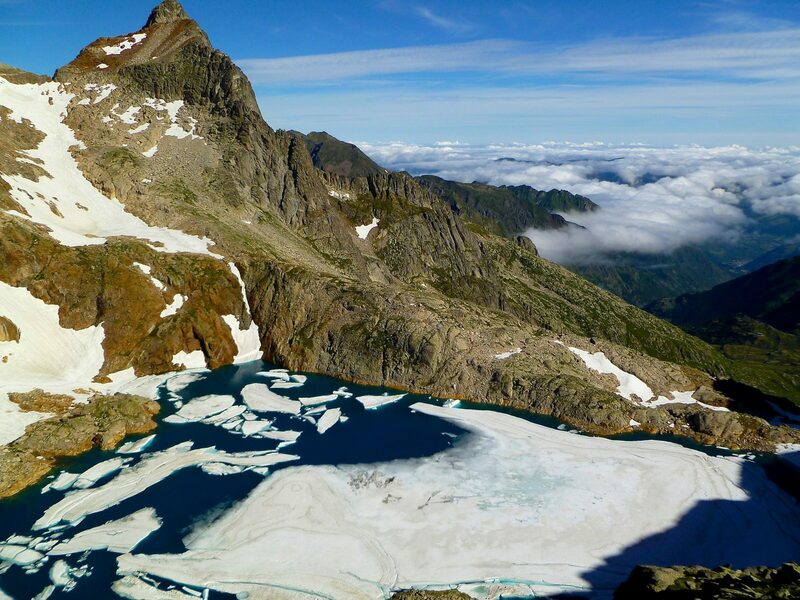 When we reach the top of this col we’ll cross from foggy France into sunny Spain. Jim’s standing on top of Port du Lavedan, watching me make the final ascent to the col. 7:30 PM, looking back south into sunny Spain. A dense fog bank stopped exactly at the col. From this same pass, looking north into France, it was dense San Francisco style fog, just like home. Camp #9. Minutes before sunset, the fog finally lifted for a fantastic view. Looking SW.
One nice thing about the Pyrenees is that you get nice alpine landscapes with plenty of snowy vistas, without going to high elevations. 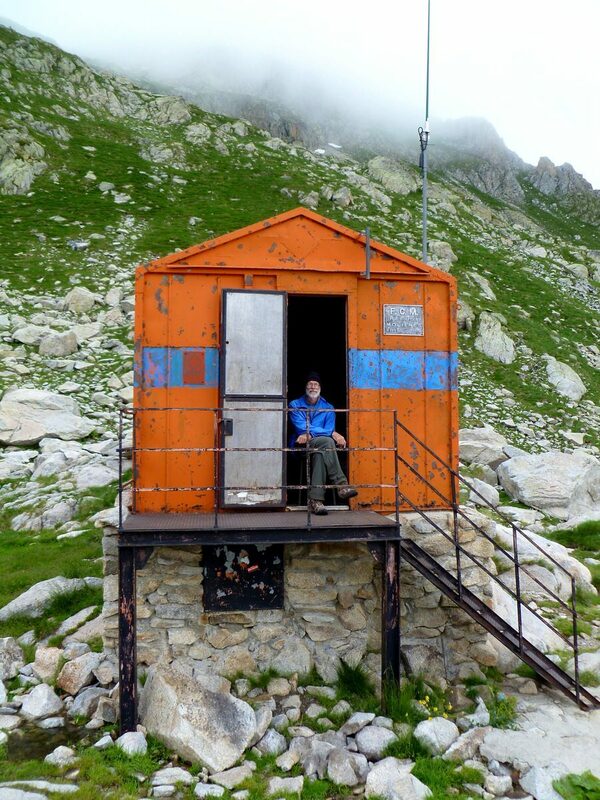 The highest point on the HRP is Col Inferieur de Literole at only 2983 meters. So the breathing is not labored and it’s a good range for people prone to altitude sickness. 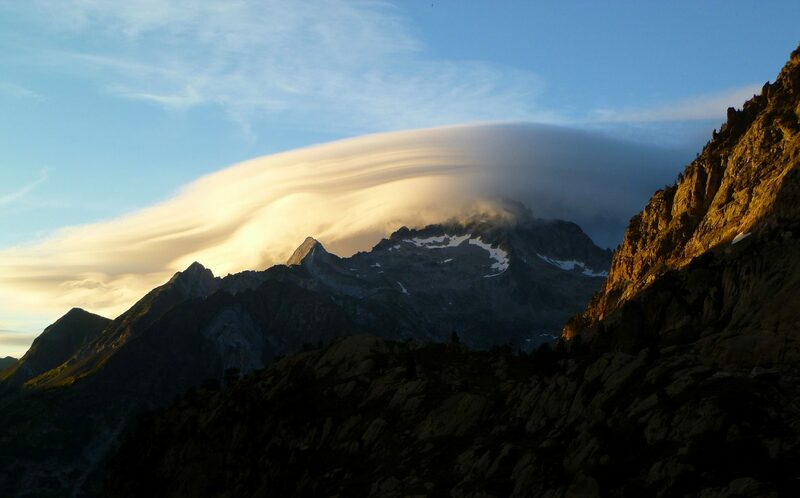 Aneto is the highest mountain in the Pyrenees and is only 3404 metres (11168 ft); even at that relatively low altitude, it has a substantially larger glacier than anything in California’s Sierra Nevada. Although the snow was quite steep in places, the steps kicked by previous walkers made passage across these sections reasonably secure. A great section of trail above a Spanish valley. 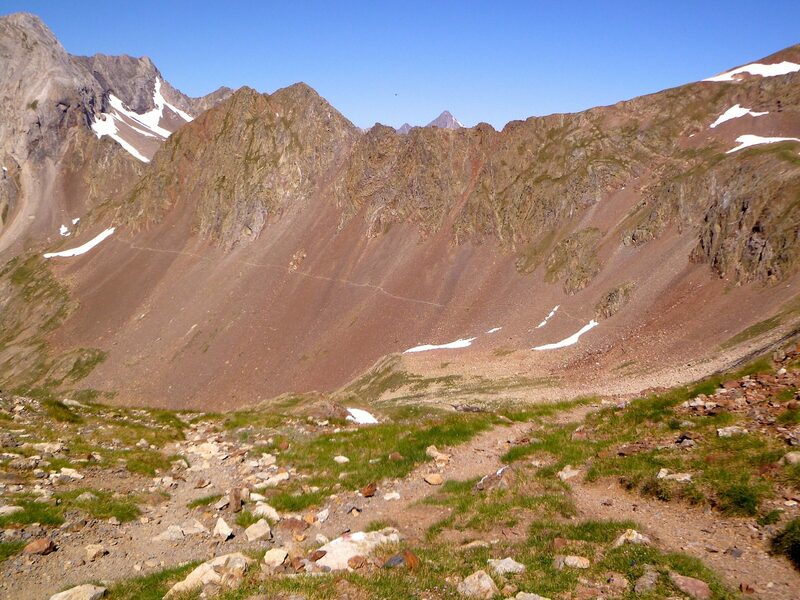 The Spanish side of the frontier ridge line is consistently drier. It doesn’t get much fog, it gets less precipitation, and it’s generally south facing. Lunch #11 was at Refuge des Oulettes de Gaube (just out of view to the left). Great view of the Vignemale glacier and lovely rock face of the Vignemale massive. After lunch, we climbed Petite Vignemale (elev 3032 meters), which is the small peak on the horizon, just left of the upper left tongue of the glacier. It’s an easy 30-40 minute hike from the col just off the left side of the photo. Camp #11. No fog! The rock wall had been built by previous users of this site. Our campsite prep process never includes wall building. The next morning on the way down into the valley. Camp #12. Another five 5 star campsite. On a flat and level shelf ~15 minutes above Refuge de Espuguettes, a couple hours east of Gavarnie. Camp #12 dinner site. We bought a half liter of wine at Refuge de Espuguettes and carried it to our campsite. Wine on a backpacking trip is a nice bonus. 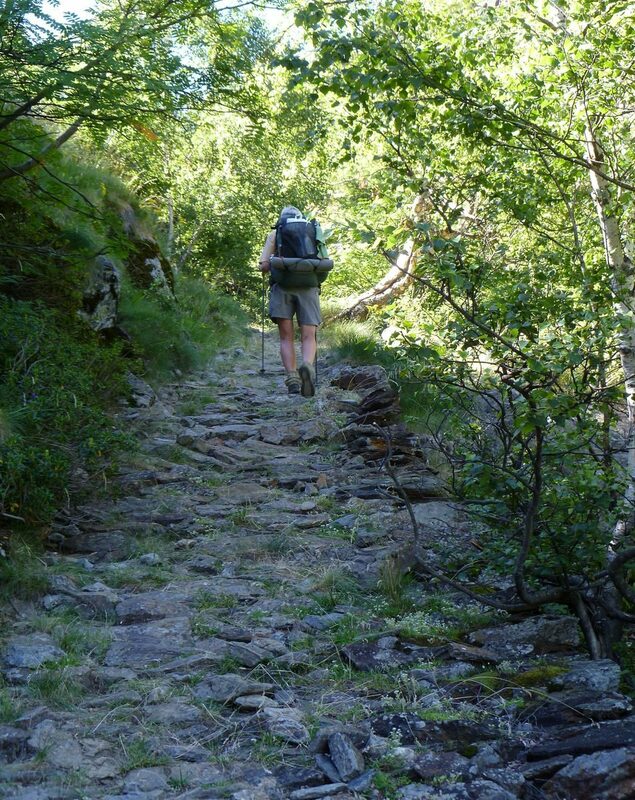 Fantastic stretch of trail between Haes and Refuge de Barroude. 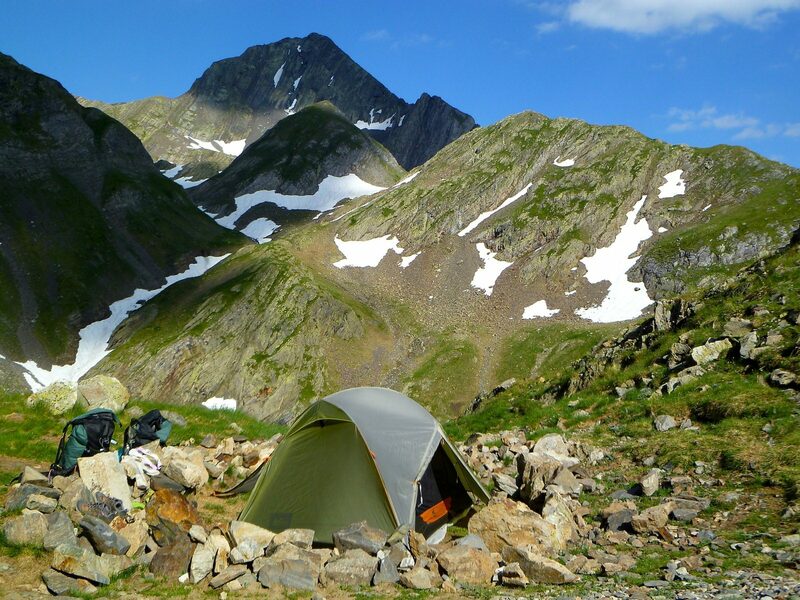 Camp #13, a few hundred yards from Refuge Barroude. Morning view. Foggy again. That night we experienced a tremendous thunderstorm with torrential rainfall. We soon had a river of water 1.5″ deep flowing under our tent. The tent performed admirably and we stayed dry. 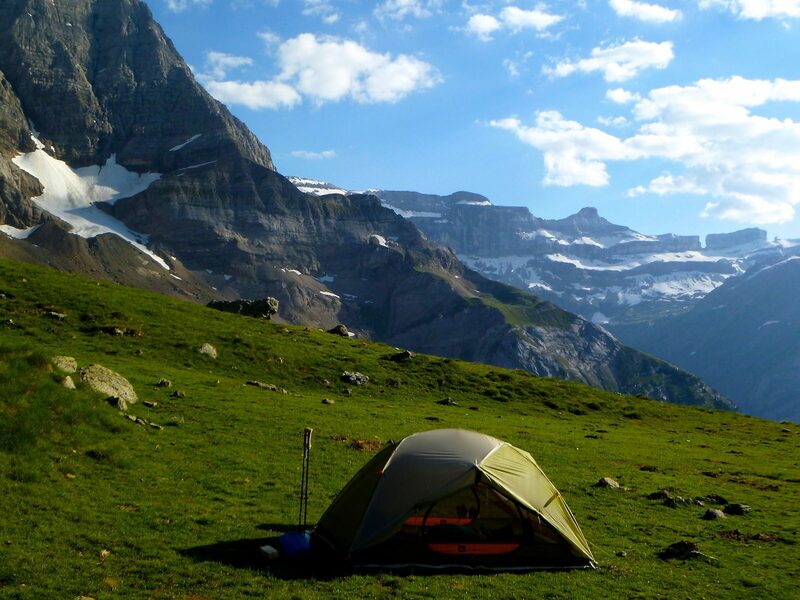 One unexpected problem with finding tent sites was that the seductive looking grassy meadows often had a type of grass with extremely sharp tips, which we were concerned could put micro holes into out tent floor and possibly pierce our air mattresses. Thus large areas of potentially great campsites were off limits. Early morning after the storm. The refuge is in the left center of the image. We chanced upon this group of 73 Spanish teenagers on a guided outdoor experience. A remarkly small number of adults were keeping the three cohorts in line. Camp #15. End of a rainy day. Another 5 star campsite. Down one snowfield, across the scree and up the next. By this time we’ve been on top of Coret de Molieres for 90 minutes, and Jim is still searching for a safe route down the east side. When there’s no snow, you can just work your way down a short hard class-2 section of rock. But the snow was too steep for us to cross without crampons and/or ice axe, and the cliff sections were forcing us onto the snow. 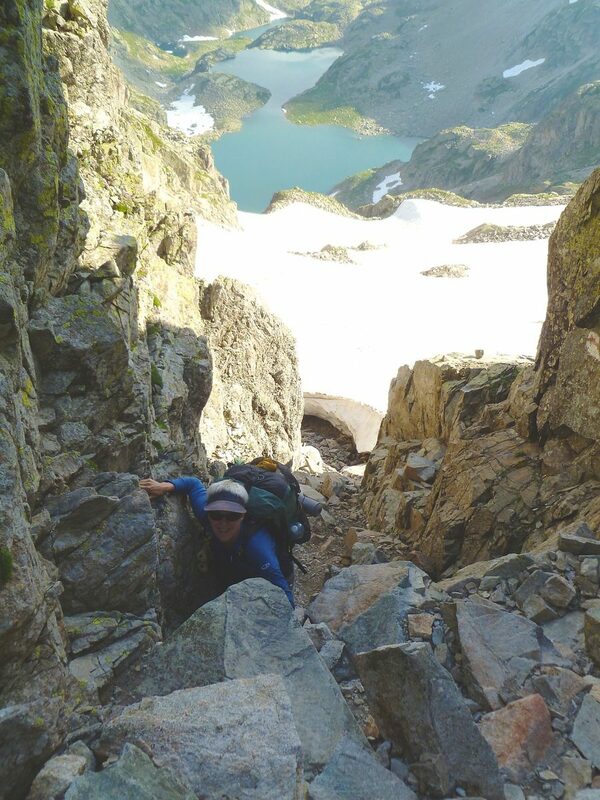 We had spent two weeks worrying about whether we’d be able to cross Col Inferior du Literola, and it turns out that the potentially uncrossable pass would be this one. This was the last serious snow of our trip. Looking back west 5 minutes after crossing the Coret de Molieres. 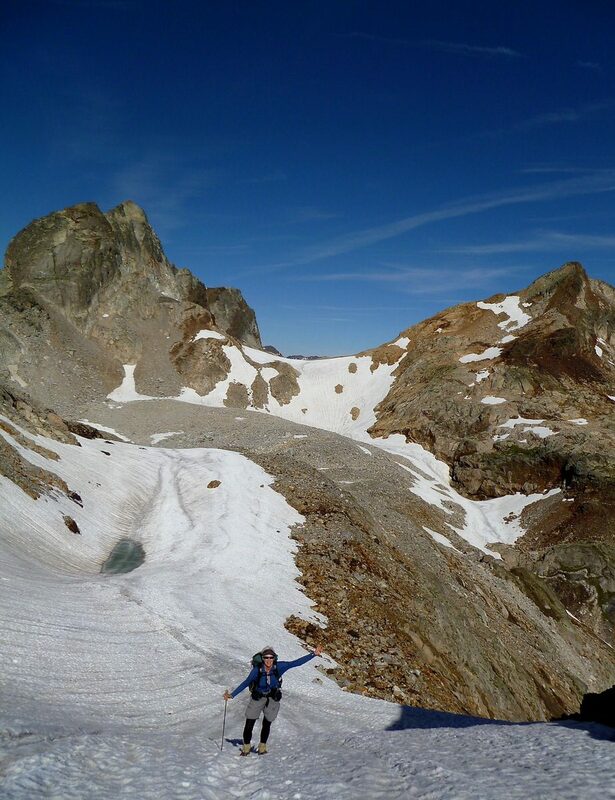 This shows the knife-edge ridge and the steep icy snowfield that posed the obstacle. 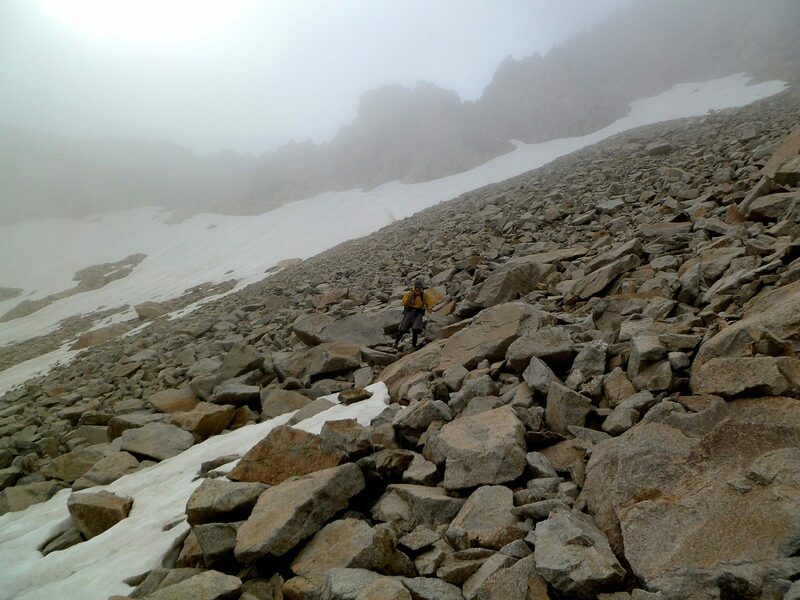 After about 90 minutes of searching Jim was able to find a safe route through the cliffs and on to a short not-too-steep piece of the snowfield. I would not have had the skills to pick out a route, so Jim earned his keep this time. This was the last serious snow on our trip. Looking east down to the 3 Estanys de Molieres. We’ll descend to the lowest of these three lakes before we find a place to spend the night at the lowest lake. We followed a cairned route through the rocks that made it a pretty straight-forward descent. Camp #18. 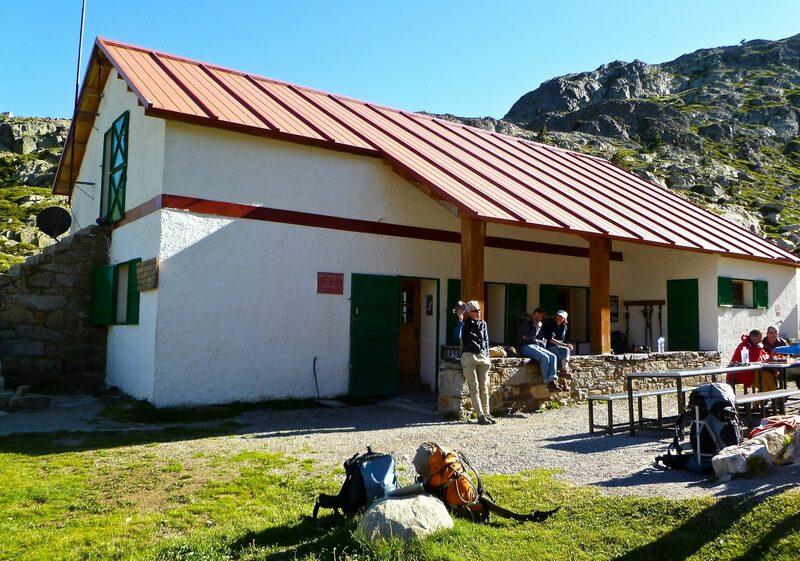 Unstaffed Refuge de Molieres. This is the first time we slept an unstaffed hut, and it was great. It was a hard descent off Molieres Col; we didn’t get down to a place with possible campsites until ~8PM; it was cool, windy, damp and threatening. We were happy to have the shelter! Amy got pretty demoralized here. In my mind, I thought the hard walking was behind us. But this day had what seemed like hours of boulder fields. I was tired and mentally ready to amble along a trail that had enough of a tread that I could let my mind wander. It was all still beautiful scenery, just a long day with too much work to do. Small village Alos d’Isil, Spain. Beautiful, but no shops or restaurants. Dinner #23 at Refuge Certiscan. Excellent and plentiful food, and nice company. Wow, a constructed trail! One of the first of the trip. Must have been an important pre-automobile thoroughfare for transporting wool or cheese or something. It certainly wasn’t constructed for purposes of recreational hikers. 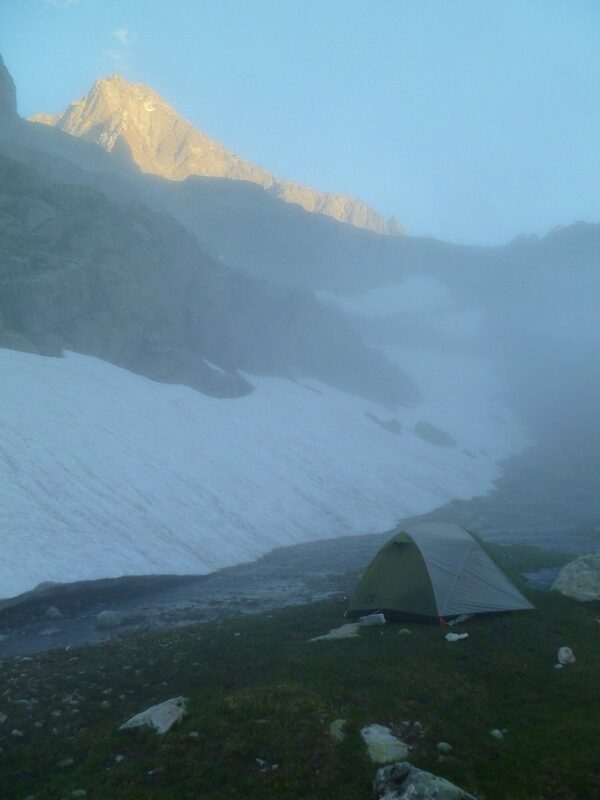 Camp #26, morning view from the nearby Refugio dd Juclar. 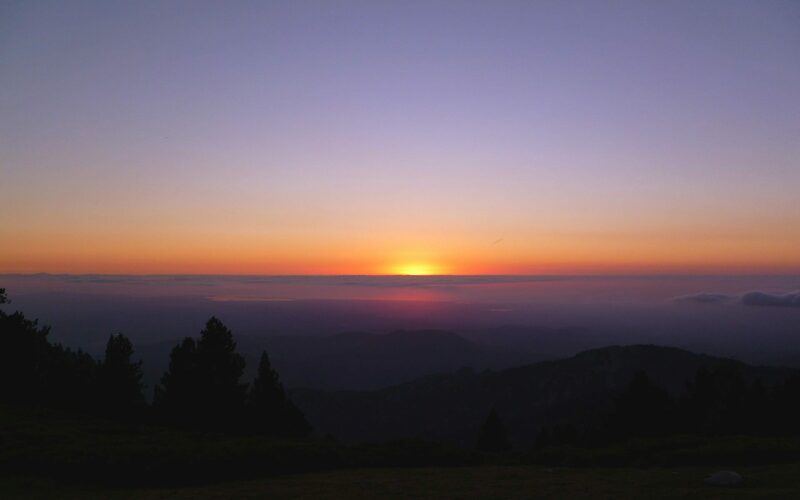 Summit of Puig Carlit. We approached from the west side, and saw about a dozen people in the previous 3 or 4 hours. The popular approach is from the east side, and there were ~30 people on top when we were there, and we saw HUNDREDS of people on the trail down the east side. Quite a scene. On top of the frontier ridge, which we will follow all day. 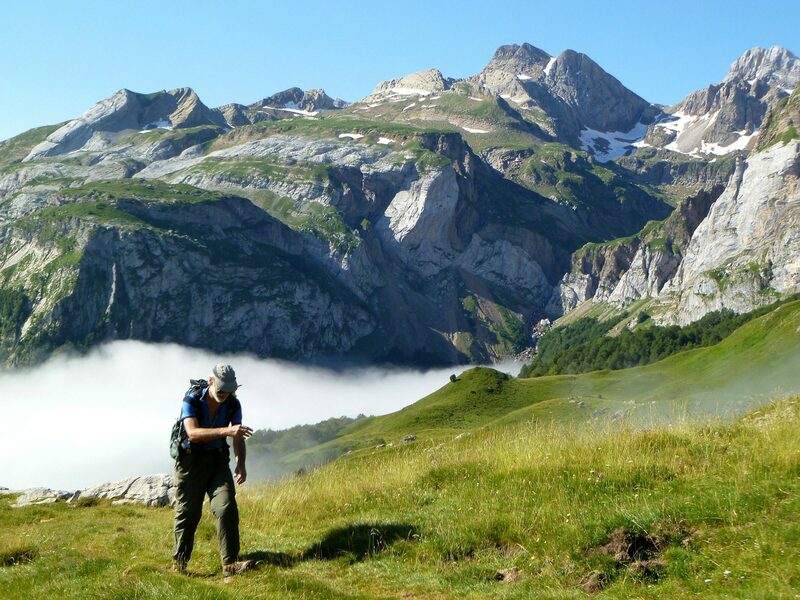 A full day of fantastic ridge-top walking, east of Valle d’Eyne. Camp #30. 5 star site. On top of the ridge “les Esquerdes de Rotja”. Catalan flag at Pic Canagou. Recently rebuilt spring, a couple hundred yards from a Ermita des Salinas (Spanish/Catalan for Hermitage). An extremely nice place on a very hot day. Camp #34. Our last campsite on the HRP, yet another five star site. On top of a high point of the long ridge we’d been walking on for hours, 360 degree views of France and Spain and the sea. The last border stone on our route, marking the frontier between France and Spain. I don’t think we noticed border stone #1, but I remember stones with numbers under 20 on the first day. It’s kind of fun and gratifying to watch the numbers grow as you walk across the isthmus – it’s reinforces the idea that you’re actually moving forward and not just hiking around in circles. The final descent into Banyuls sur-Mer. Passing through ancient and mostly abandoned agricultural land. This area was rich with vineyards and olive orchards, and the stony hills are laced with old small terraces. We have additional captioned photos in Smugmug. This was a five-star trip and I put it on my Top Ten List. I thoroughly enjoyed every day of our 35 day thru-hike. Diversity is important to me when taking a long walk, and the HRP has great scenic, habitat, and cultural diversity. The granitic high mountains were very handsome, reminiscent California’s Sierra Nevada; the lower altitude eastern and western stretches were also very scenic and worthwhile. We had five-star campsites nearly every night. I enjoyed eating the good food at the refuges. It is emotionally gratifying to walk from coast to coast and I felt a real sense of accomplishment. We saw enough people to make this a fun trip socially, but not so many that it felt crowded. The HRP was one the best backpacking trips I have ever completed. 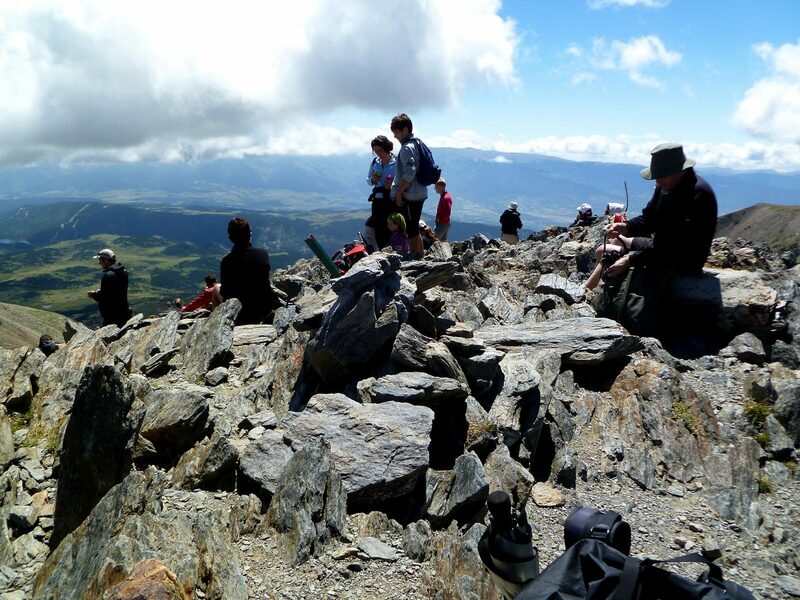 The entire experience was highly rewarding, ranging from fabulous scenery to high quality walking. It wasn’t an easy hike given the large and frequent altitude changes to contend with. We worked hard to do this route. But just about every day there was something that offered significant rewards. The vistas often matched those in the Sierra Nevada, which is my gold standard for mountain walking. 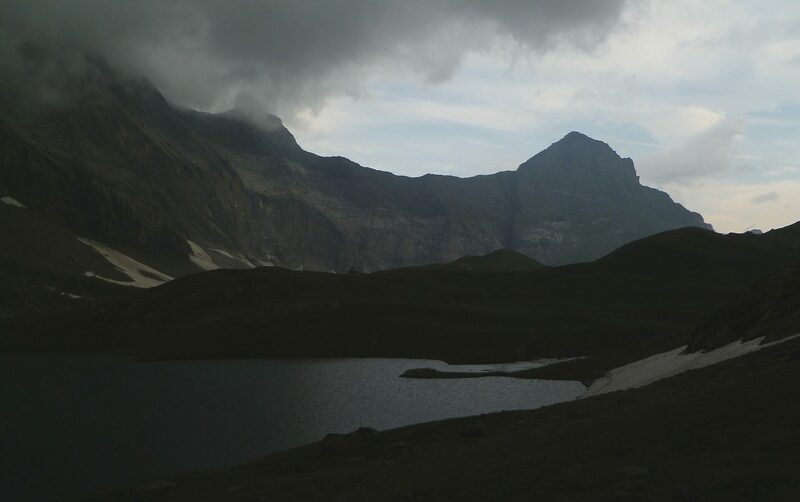 High rocky peaks, big granite walls, lush valleys and deep forests all added to the pleasures of this trip. The route has great integrity and confronts the terrain head on. It was psychologically satisfying to walk from ocean to sea following a mountain crest. I would highly recommend the HRP to anyone with the proper skills and experience who wants a beautiful and challenging backpacking trip. We are including a lot more detailed information than in many of our trip reports. We hope this may encourage more people to walk this route, particularly American long-distance hikers who seem inordinately focused on the PCT, CDT, and AT, while ignoring some great long distance hiking in Europe. 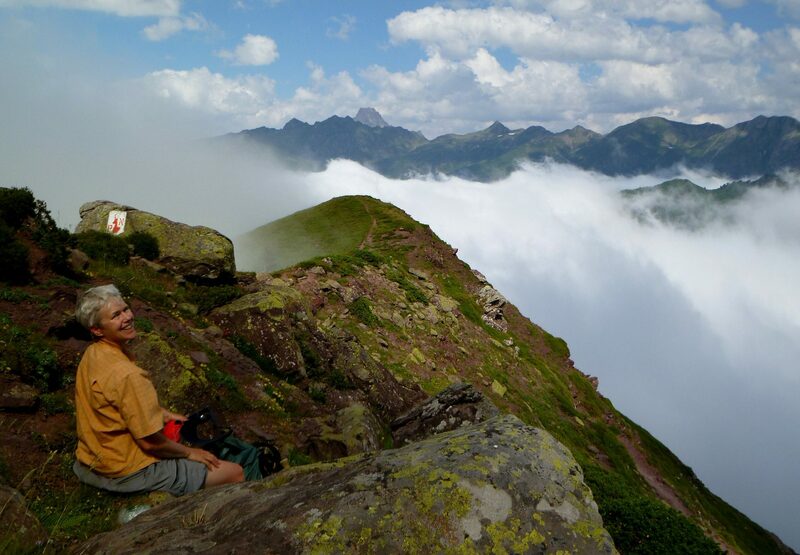 The Pyrenees are located between the Atlantic Ocean and the Mediterranean Sea along the border between Spain and France. 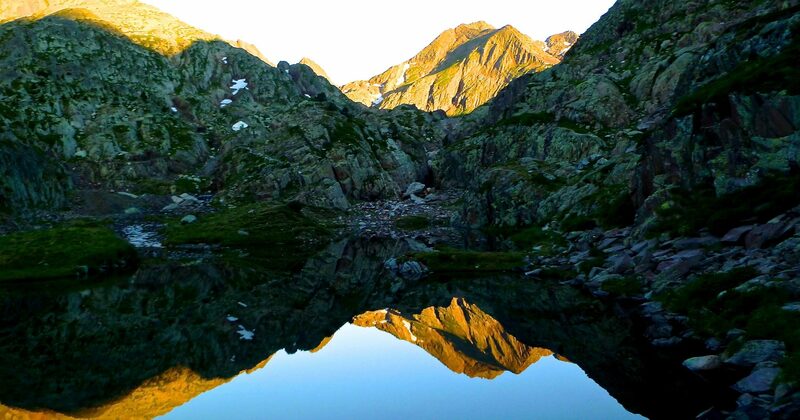 The range also encompasses the tiny land-locked country of Andorra. The high point is Aneto, 11,618 feet. 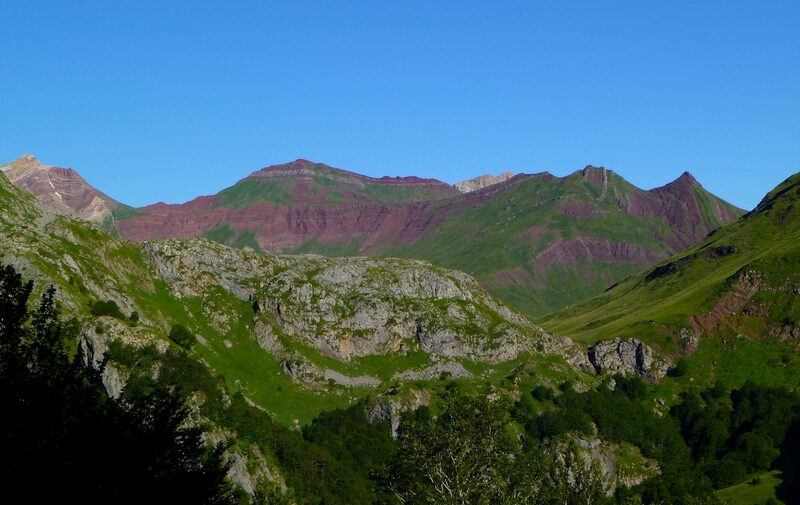 There are three established coast-to-coast routes in the Pyrenees: the GR10 in France, the GR11 in Spain, and the HRP along the border between the two countries. All three run from the Atlantic to the Mediterranean. The GR10 and GR11 are defined and waymarked trails, whereas the HRP is more of a concept and different authors have mapped different high routes from ocean to sea. 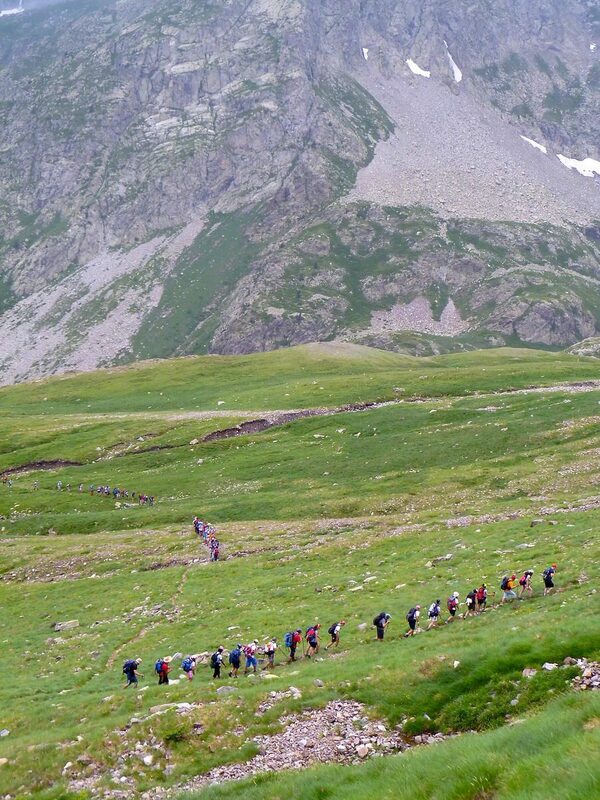 The GR10 and GR11 tend to oscillate between the lower altitude villages and the higher passes in the mountains while the HRP stays as high as is practical most of the time. The HRP is pieced together from various small tracks, existing trails, cow-paths and cross-country segments. It is not a formal trail and is not waymarked. When the HRP was concurrent with the GR10 or GR11, those trails’ way-marks were usually good. The first guidebook to the HRP was published by Georges Véron and is currently available only in French. We followed the route described in Ton Joosten’s 2004 Cicerone Press Guide; this differs from Véron’s in many places. There are sections where the 2004 route was also significantly different from the 2009 edition of the same book. Finally, alternate routings are mapped on both the Spanish and French 1:50,000 topos. We followed Joosten’s 2004 primary route and never used his lower altitude alternates. Joostens’ route is based on the premise of using refuges for meals and lodging. 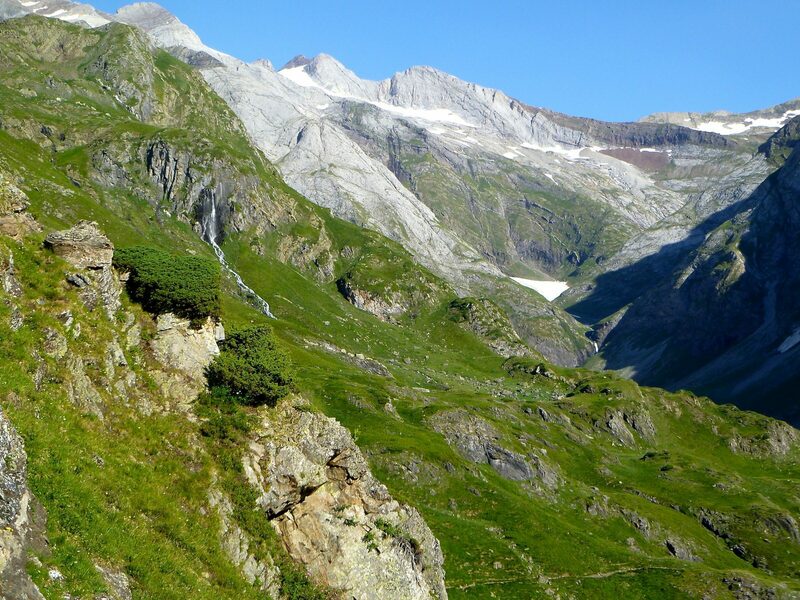 Thus there are places where you will descend to a refuge in a valley only to immediately climb out on the other side although what looks to be a perfectly feasible ridge route would avoid the descent. In some places, if you don’t need to visit a refuge, you could possibly modify the route to make it shorter and/or reduce altitude loss and gain. Then again, you wouldn’t be following Joosten’s route. We went west to east as the guidebook is written in that direction. There is no reason the route wouldn’t work as well in the other direction. After completing the HRP we had some time left before we had to fly home, so we elected to do some more walking, mostly on the GR92. We headed south along the Spanish coast through Llanca, Roses, L’Escala and Estatit. The 92 then went inland through La Bisbal d’Emporda, Llagostera, and Caldes de Malavella. From there we went into tourist mode and visited Girona and Barcelona before returning to Madrid and our flight home. We purchased the 1:50,000 scale maps recommended in the Cicerone Guide from OmniMap.com. and spent hours marking the HRP on the maps and photocopying the relevant areas onto 11×17 paper. This was time consuming, but the original maps are far too large and heavy to carry in the field. We did not have an iPhone at the time. Today, we recommend two smartphone apps which provide access to excellent French IGN maps: Gaia GPS and Iphigenie. Navigation was relatively straightforward. We used Joosten’s guidebook, 1:50,000 French and Spanish topo maps, an altimeter, and a compass. We did not have a GPS on this trip. In conjunction with the maps, Joosten’s book is essential and adequate, but we found it frustrating at times. Frequently the instructions were phrased in a way that made it unclear which side of a landmark you should be on, such as “pass the lake on the left” which is intended to mean “pass with the lake on your left side” as opposed to “pass on the left side of the lake”. Ambiguous words like “few” or “soon” are used to describe a distance or elapsed time: “shortly the trail will branch” could mean in 1 minute or 15 minutes. We were confused in a few locations by some changes on the ground that occurred between the time the guidebook was written and our 2010 hike, such as newly paved roads or ski-lift pylons that had been removed. Presumably the 2009 version of the guide is more up-to-date, and many hikers today will carry a smartphone with a GPS app, so navigation should not be challenging. We also believe that having a good “mountain sense” will help you to stay on track. 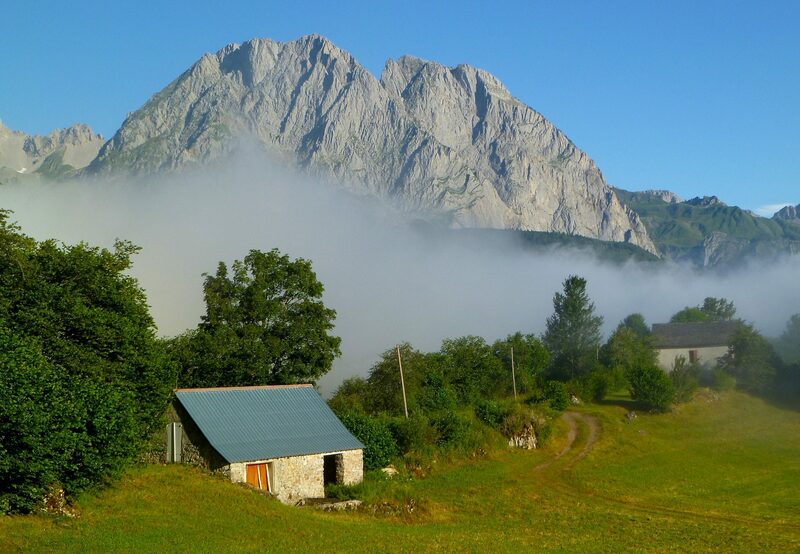 Fog heavy enough to reduce visibility to no more than a few yards is not uncommon in the Pyrenees and when that happens, navigation can become a significant challenge. A GPS would be a useful tool in these conditions. 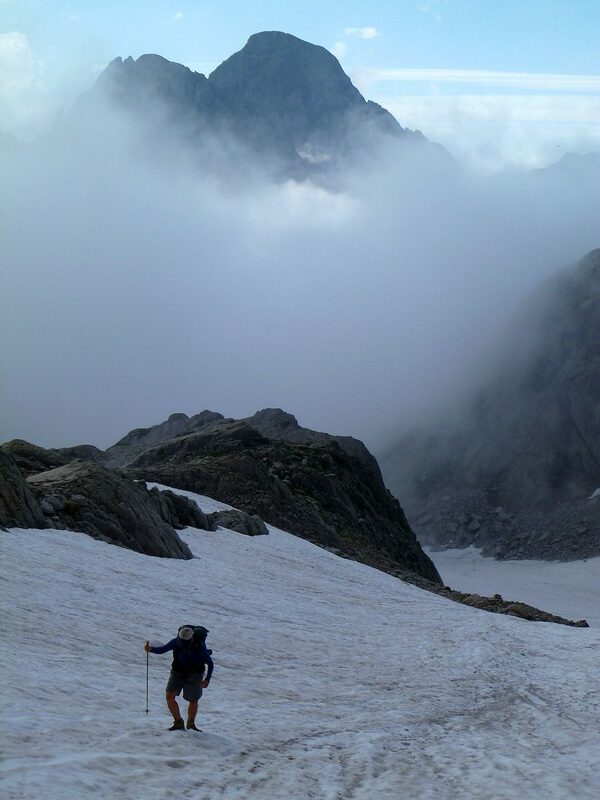 However, even with a GPS, fog makes it tough to pick out a good route over a rocky pass; the GPS ensures you are crossing the right pass but doesn’t help to pick a safe route through the rocks and cliffs. 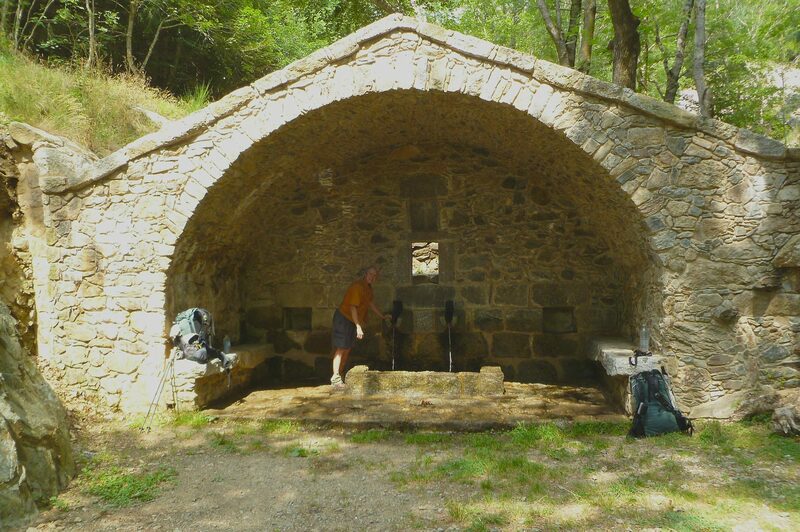 Another problem with navigation is that free-lance cairn building appears to be a national sport in the Pyrenees. It is quite common to see innumerable cairns leading off in multiple directions, or just fields of cairns that don’t appear to form a thread leading anywhere. Joosten’s route traverses a number of summits. 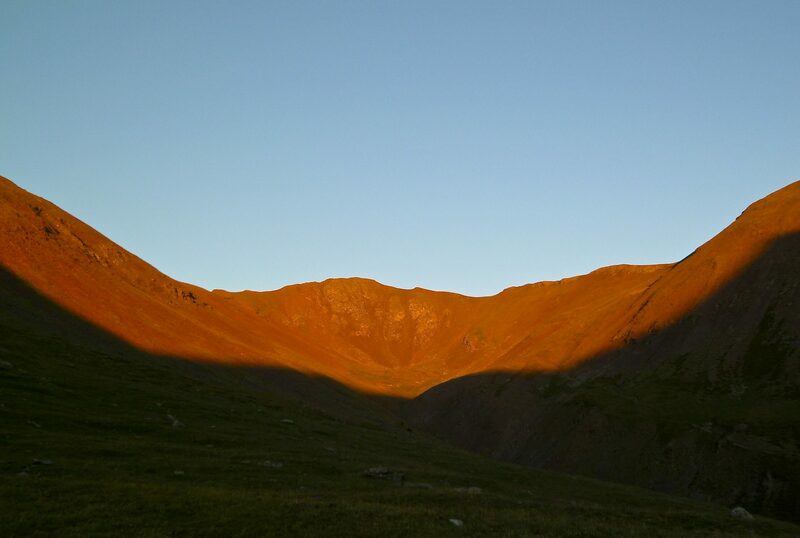 In addition, we climbed two peaks, Petite Vignemale and Certascan, each of which was less than an hour off-route. 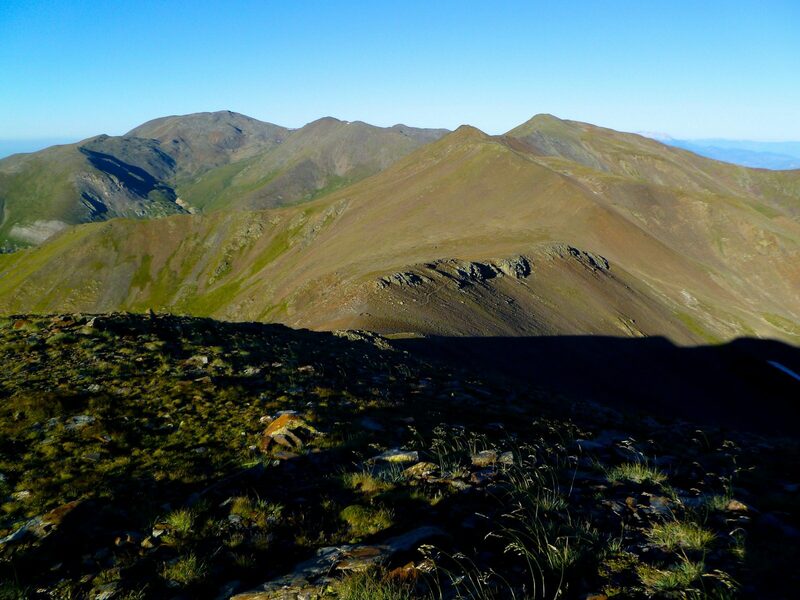 We also traversed the five summits beyond Coll d’Eina on day 30. There are numerous opportunities to climb other summits. 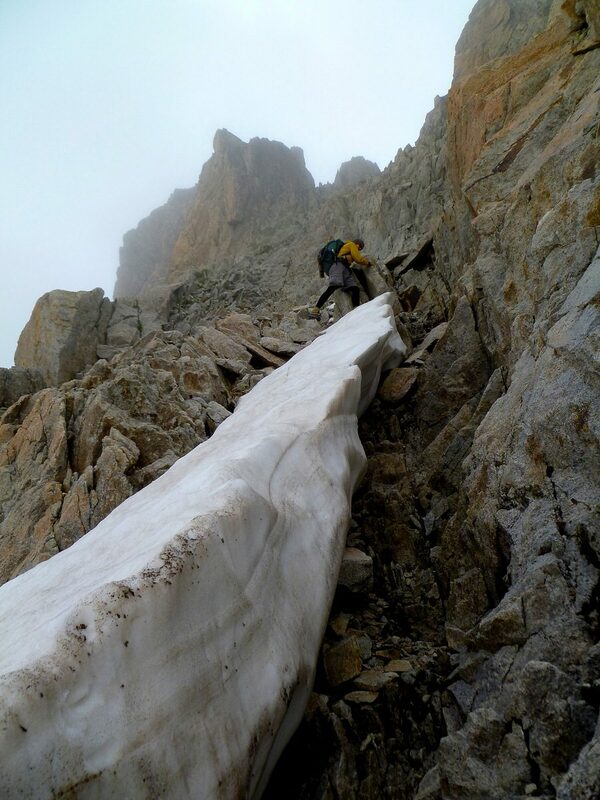 Many of the routes, while not technically difficult, usually require snow-climbing tools to ascend safely. Hendaye, France is the western terminus of the HRP. We flew to Madrid and took trains to the Spanish border town of Irun and a tram into Hendaye. There are also rail connections to Paris and other French cities. Banyuls-sur-Mer, France is the eastern terminus. It is well served by public transportation. Both places are popular beach towns and have all the services you could want. Potable water was frequently available, and we treated water on only a few occasions. There were only a couple of dry stretches, each no more than a half-day long. Although most of food shops on the route are either “tiny” or “small”, they all had some basic provisions: virtually all shops had high quality locally produced cheese, sausage, and bread; nuts, dry fruit, cookies and crackers, chocolate, yoghurt, and canned tuna could usually be found. We have not carried a stove since 1995. We never saw a selection of freeze-dried foods in any of the markets we used although there are a couple of outdoor stores in Gavarnie that may stock them. We ate at nearly all the restaurants and staffed refuges we passed if food was available when we were there, but we generally did not modify our schedule in order to accommodate serving times. We were able to purchase food at refuges at any time of day except between about 5:00 and 7:00 PM, when the kitchen staff was preparing the evening meal. Day 0: Hendaye: before starting; several adequate grocery stores in town. Day 2: Arizkun: two small stores with limited, but sufficient selection. Day 3: Les Aldudes: a surprisingly useful quick mart in the gas station. Day 5: Col Bargargui (Irati); very small shop at the ski resort. Day 6: Lescun: a well-stocked medium sized market. Day 20: Salardu: barely adequate small market. 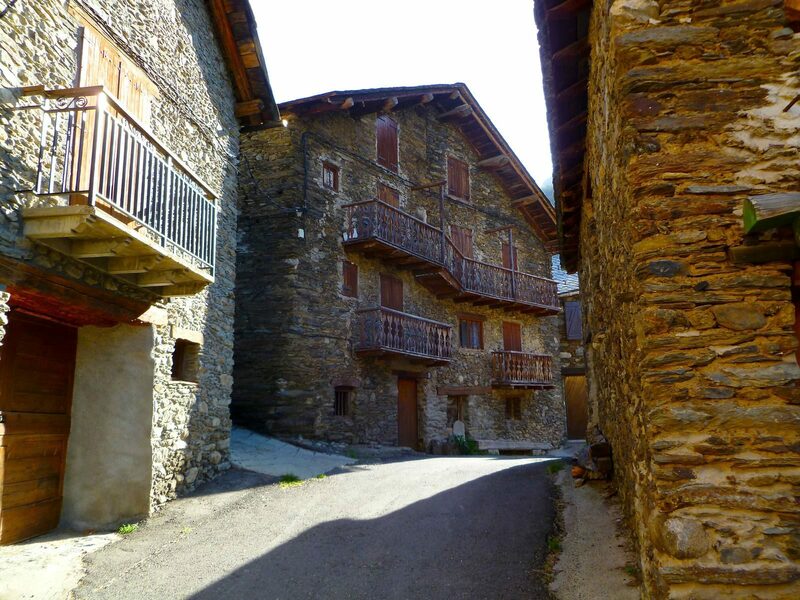 Day 27: l’Hospitalet-pres-l’Andorre: barely adequate small market and deli. Day 29: Bolquere: excellent market and great deli. Day 34: Le Perthus: huge stores with everything you could ever want. Some of these stores are seasonal and many are not open 7 days a week. This data is from 2010 and there may be more or fewer options now. 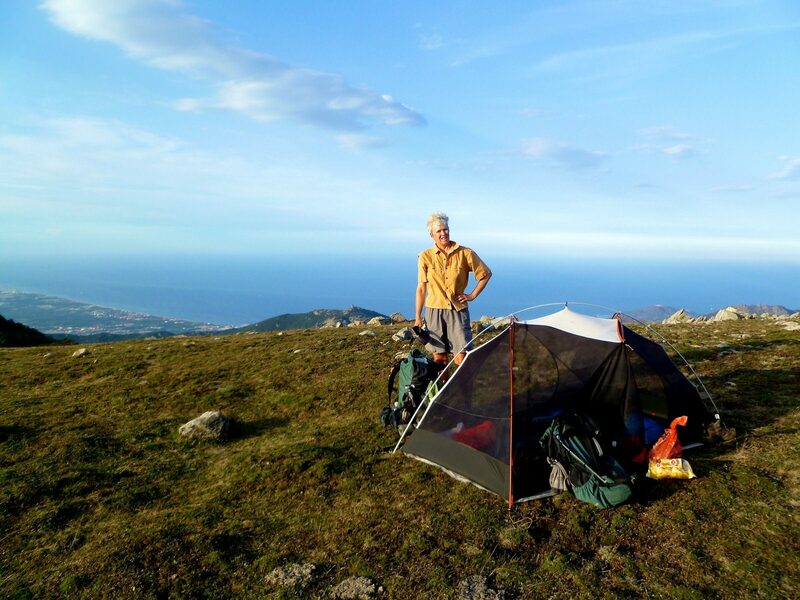 We spent a night in a commercial campground in Hendaye prior to the start of our walk, nights in hotels in Salardu and Banyuls-sur-Mer, two nights in unstaffed mountain refuges, and 31 nights wild camping. We stealth camped only once, tucked in behind a barn and hay bales on the edge of Lescun; our remaining camps were in the open. Other than at Lescun, we never felt a need to hide our campsites, and it appeared that many other people behaved the same way. 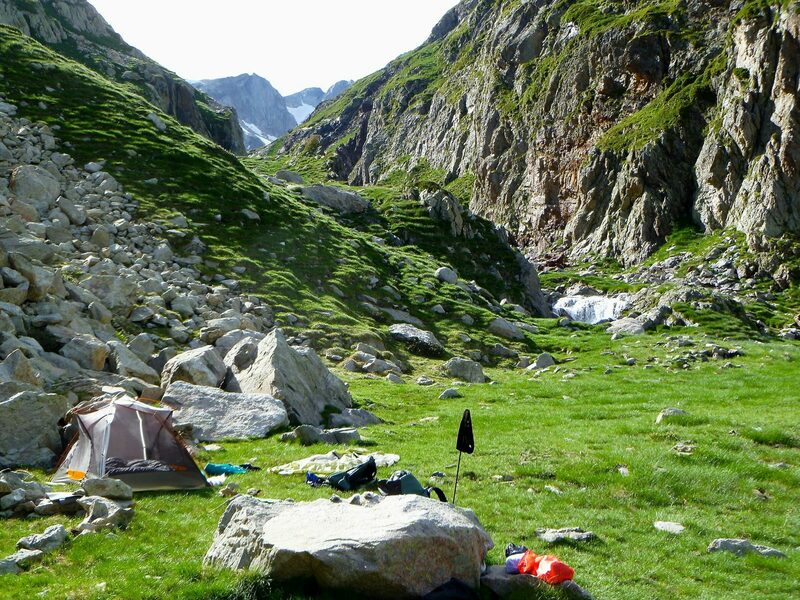 In theory, you are not supposed to camp in French National Parks. 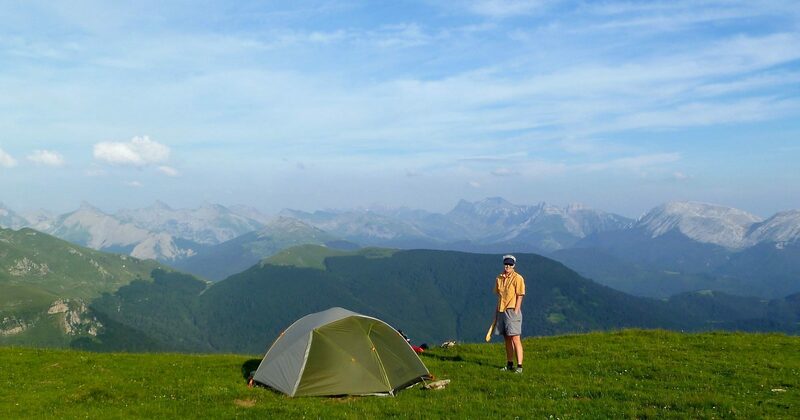 However, in Europe there is a difference between camping and bivouacing: a bivouac is setting up your tent late in the day, spending one night, and moving on in the morning and it is supposedly acceptable to the authorities. In any case, we never had any adverse encounters with park rangers in either Spain or France. We had so many 5-star sites that we lost count. Nearly every campsite on our trip had a fantastic sense of space and great views. That said we did find two problems in finding campsites. First, there were a number of sections where we walked for 2 to 3 hours through rocky terrain with no obvious spots to pitch a tent. 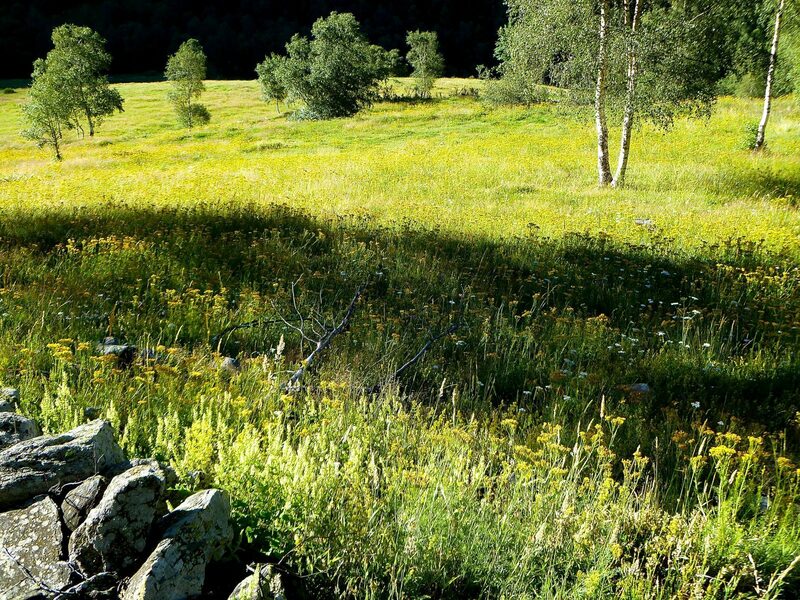 Second, many luscious looking meadows are covered with a grass with extremely sharp tips. 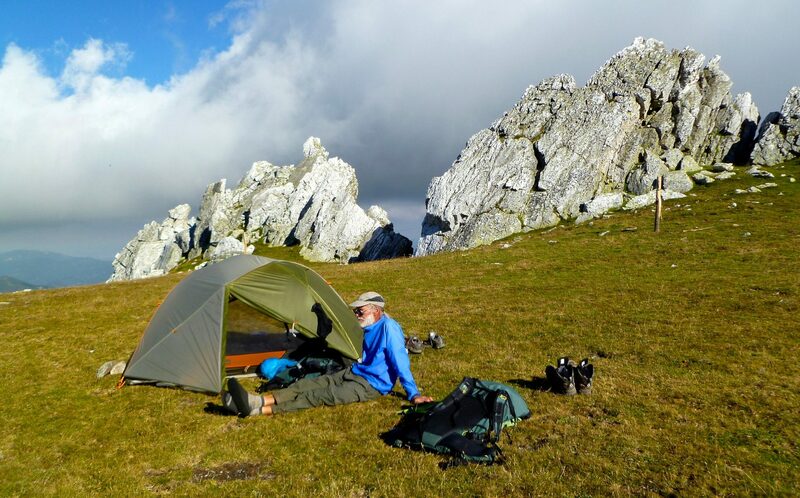 These grass tips were so sharp that they easily passed through our spinnaker cloth ground sheet and we were concerned that they could puncture the coated floor of our tent and even possibly our NeoAir pads, so we never set up in these locations. That said, we were always able to find a good site sooner or later. Many people camped right next to refuges so they could eat dinner there before retiring to their tents. We prefer more solitude, and we’re very picky about finding a flat site on level ground, so we rarely camped near refuges. We were not interested in sleeping in refuges, but we enjoyed the meals, and eating at refuges lightened our pack weight considerably. The meals were surprisingly good and plentiful, and, on occasion, excellent. Prices seemed quite reasonable given that the refuges usually don’t have road access. A good mid-day omelet with bread cost 4 to 7 Euros. A three-course dinner with soup or salad, an entrée with meat and rice or potatoes, and dessert cost about 15 Euros per person. Wine cost 3 or 4 Euros per half liter and we often bought some to carry out. 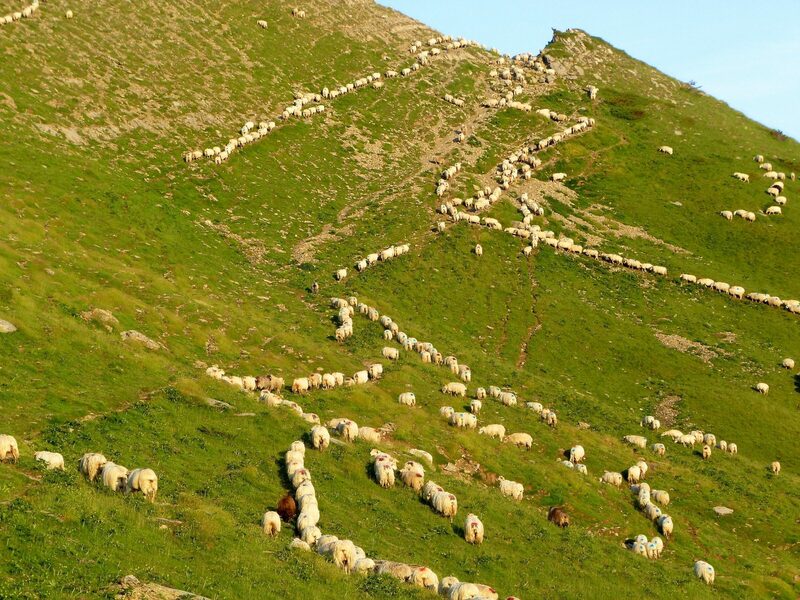 Some people find that the scene at the refuges disrupts the sense of being in the wilderness, but for us, the refuges seemed as appropriate to the route as the shepherds and their animals. Other people like the refuges because of the social scene; a Tasmanian couple we met mailed their camping gear home after a week and spent the rest of the trip in refuges, primarily because they enjoyed interacting with the people they met. Spending the night in refuges is not to everyone’s taste. Sleeping quarters are cramped and communal and thus noisy and have no privacy. Not including transport to and from Hendaye and Banyuls, we spent ~$200 USD for maps, ~$150 for 3 nights of paid accommodation, and ~$28 per person per day for food and beverages, based on an exchange rate of about $1.29 USD to the Euro. The HRP does not have as good a walking surface as the John Muir Trail or the National Trails in the UK. 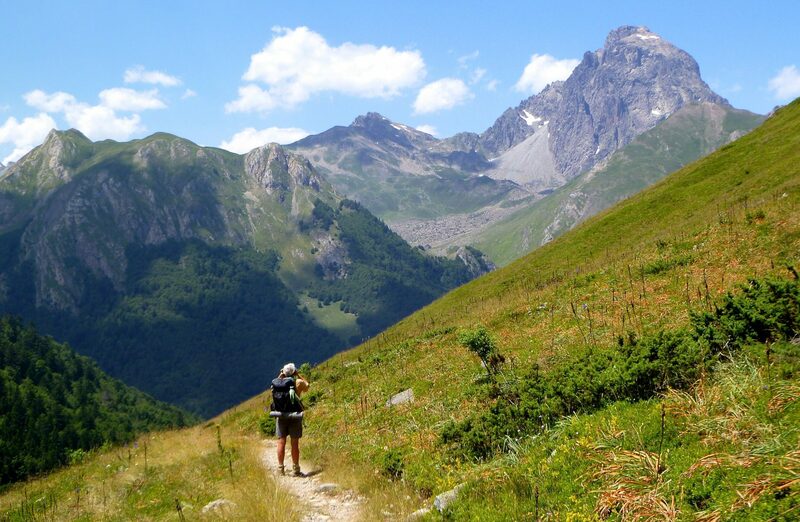 There is essentially no trail maintenance in the Pyrenees and erosion is common. Much of the route is not on designed trails as we think of them, but on use paths that have developed informally over the centuries. 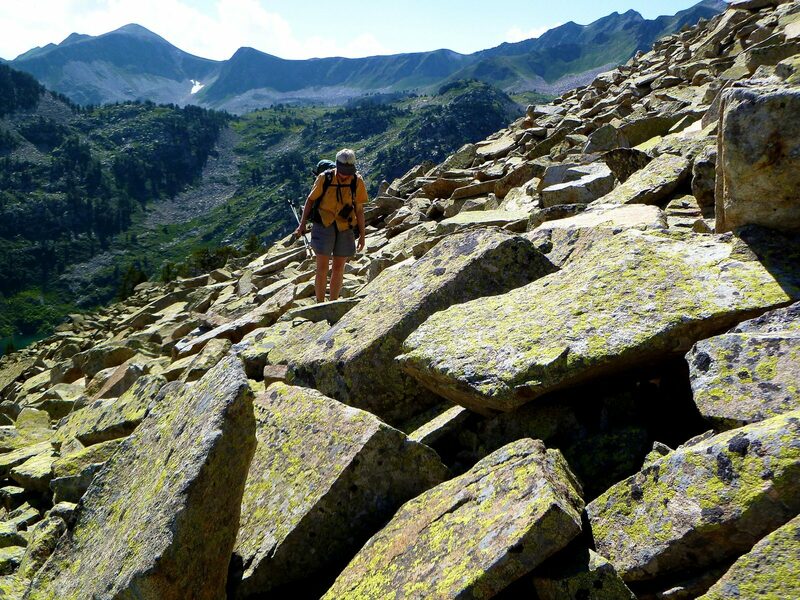 These paths are often steep and frequently covered with loose rocks of all sizes. There are not many long trail sections where you can walk in a day-dreaming or cruising mode; you have to watch where you place your feet. There are many places where trails fork without any signs, and a lot of these small trails are not on the map. At lower elevations, much of the hiking was on farm tracks and country lanes: all offered easy walking. There was essentially no bushwhacking required anywhere on the HRP. There are a couple of short hard class-2 or easy class-3 rock scrambles. None of these will be problematic to anyone with basic rock climbing skills. There are also many snowfields, and for several of them Joosten recommends crampons and an ice ax. We had neither and each of us used a single trekking pole for stability on the snow. Whether one can safely cross the snowfields depends on several factors. The amount of snow depends on the preceding winter’s snowfall, and how much of it has melted off. Obviously, all other things being equal, the later in the season you go, the less snow you will find. The second factor is when in the day you cross the snow and what the very recent weather has been like; when the snow is icy due to cloudy weather and/or morning conditions, it is more problematic than soft snow on a warm sunny afternoon. And the third factor is the condition of the steps previous climbers have made. 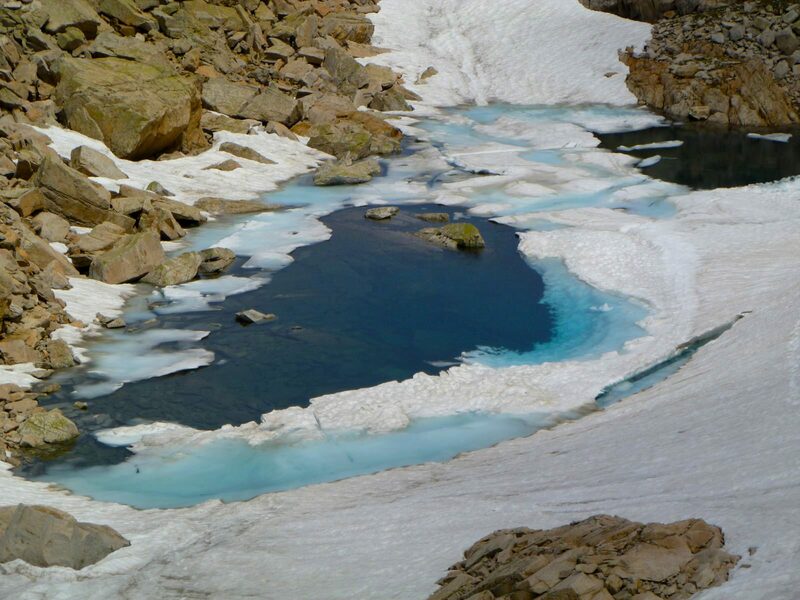 There are snowfields, such as Col Inferior de Literole, where if you slip into an uncontrolled slide, you will likely be injured. We were fortunate that on the steepest passes the snow had been sun-softened and the steps were adequate. However, if the slopes had been icy and/or without steps, we could not have crossed them safely. Thus, in our opinion, each person should decide for themselves what they are comfortable doing and whether or not to add the weight of an ax and/or crampons (instep crampons should be sufficient) to their pack. You can always take alternate routes around these obstacles, but then you miss some of the most glorious country as well as the satisfaction of completing the route on its own terms. The HRP never gets higher than about 10,000 feet. The route starts at sea level and only reaches higher elevations after a few days of walking. Thus it could be a fine alpine trip for people susceptible to altitude sickness. 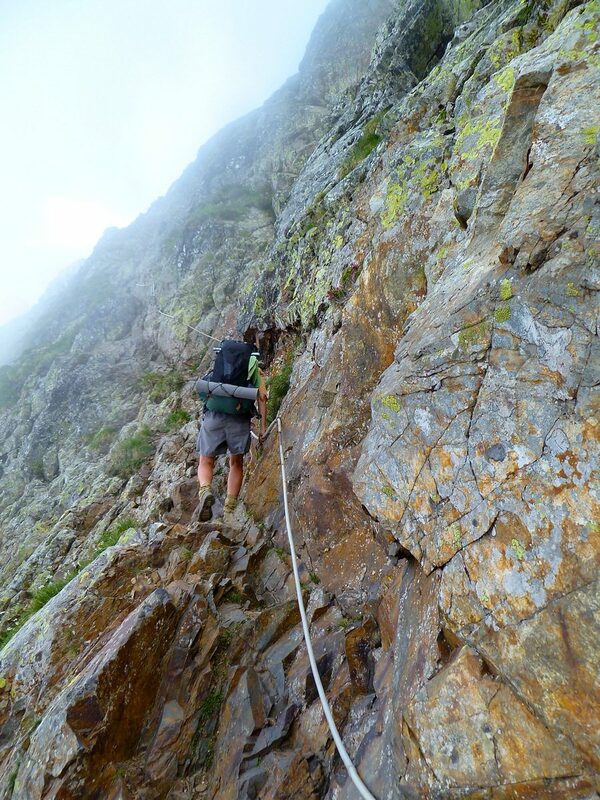 With a very few exceptions, the HRP is not technically difficult in a mountaineering sense. However, it is physically quite demanding. The route is constantly gaining and loosening altitude. 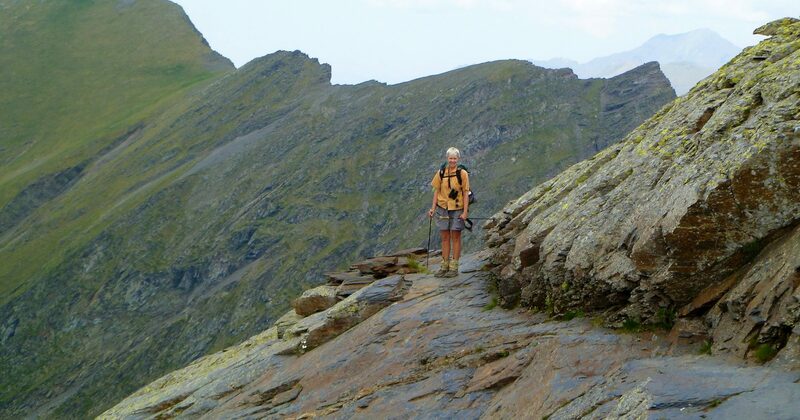 Joosten, in his 2004 guidebook, understates that altitude gain as he only accounts for the deltas between major high and low points and does not include the minor and not so minor ups and downs that can add so much to a day’s climb. We did not turn on the “accumulated gain” feature of our altimeter, but guess our actual gain was at least 10-20% higher than the published 42,350 meters (139,000 feet). We have seen published distances for the HRP that range from 800 to over 1000 kilometers. Distances actually walked are difficult to estimate. As on many European trails, Joosten and the trail markers all list hours between points, not kilometers. How many hours you take obviously depends on how fast you walk and how many times you stop. 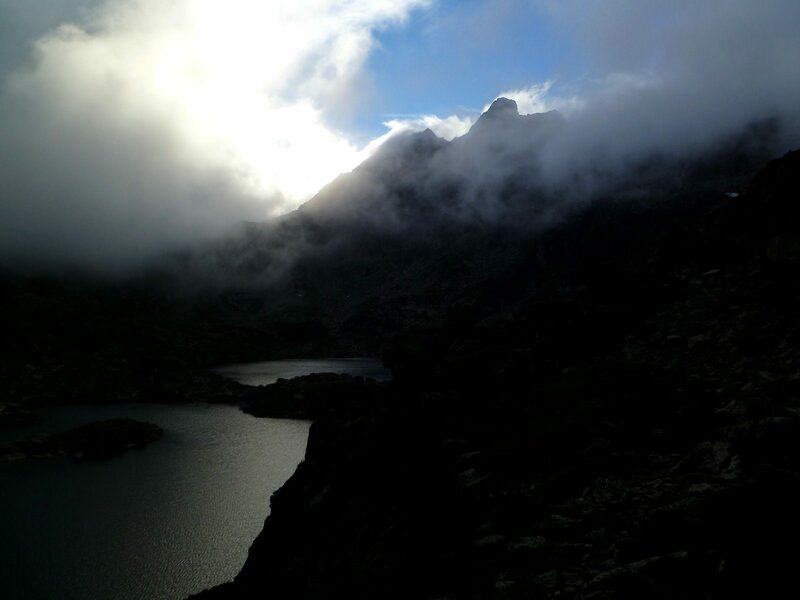 The scenic quality of the route is consistently excellent and the walking interesting and rewarding. The grass was green and the flowers blooming. The mountains were very attractive and in places stunning. We were pleased by how much we enjoyed the vast majority of the route. Even at the lower elevation beginning and end, the HRP is well worth walking. 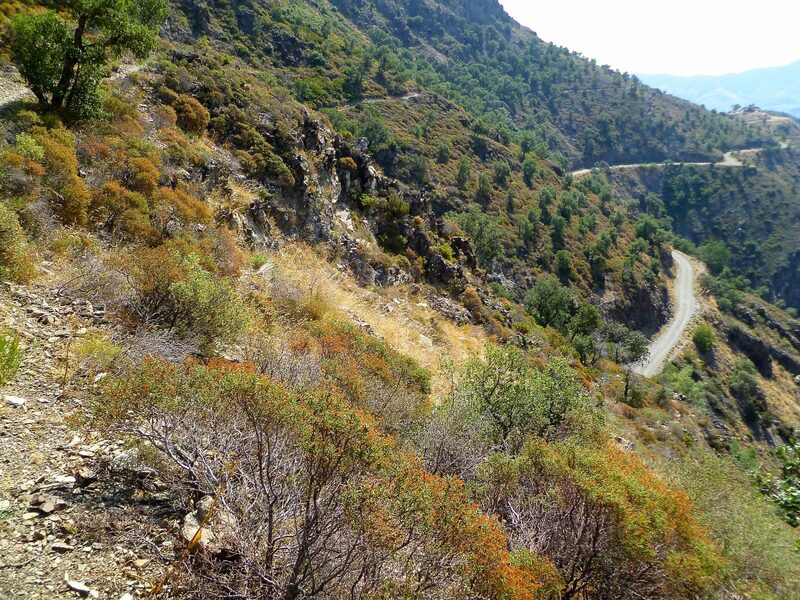 Only at Col d’Perthus does the route descend to a truly over-developed place. While nothing on the route could be considered remote by North American wilderness standards, the overall ambience is traveling in mountains that appear to have only been lightly touched by the humans who have lived in and used the area for thousands of years. There are almost no téléphériques lacing the mountains like in the Alps. There are not many paved roads crossing the mountains and you can walk many days without encountering one. Almost all the inhabited places are in the lower valleys, so the higher sections of the HRP have are no buildings other than the refuges and an occasional herder’s cottage. 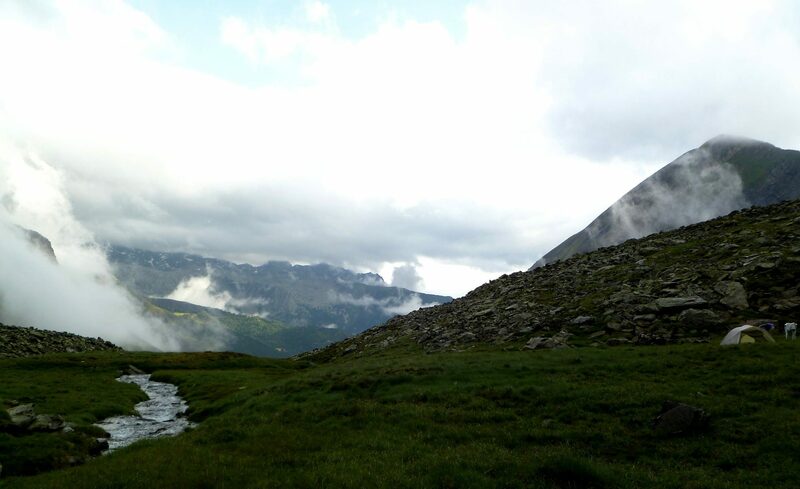 This was our eighth hike of three to five weeks in Europe. We have our gear dialed in for what suits us in the trade-offs between weight, comfort, convenience, and happiness. Our base pack weight was 13.5 pounds (6.1 kg) each, which was quite light compared to the other backpackers we saw in the Pyrenees. We had only one day with enough rain during daylight hours to use raincoats. We had rain during the night a half dozen times, including a few walloping nighttime thunderstorms, but we generally enjoy any rain that occurs after we have our tent set up. Strong winds were fairly common, but rarely problematic. 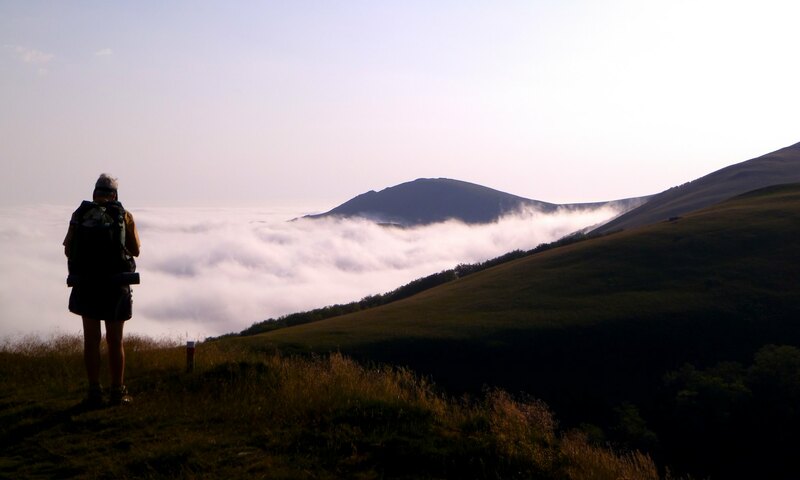 There was dense fog in France for at least half the trip, but it was nearly always below us. 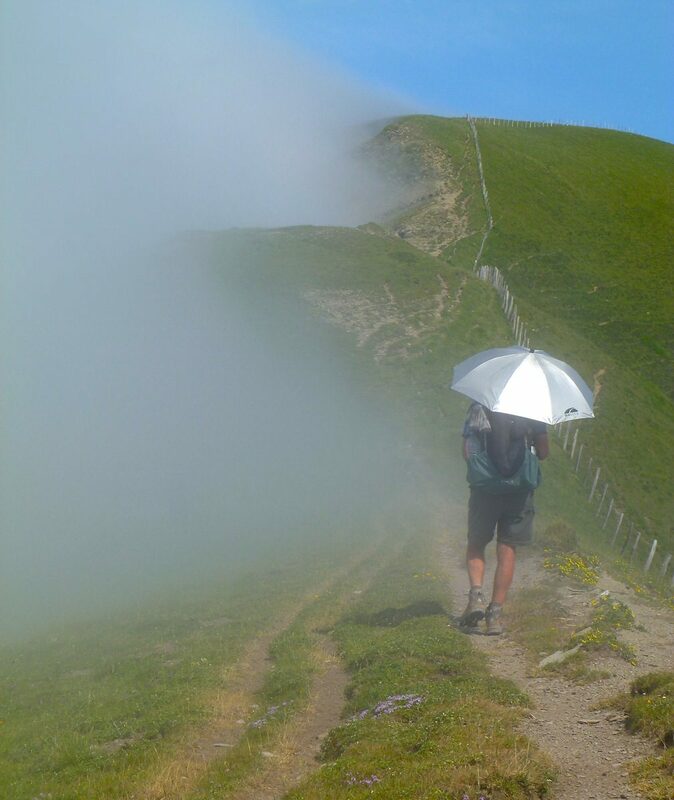 We walked in significant fog for 3 or 4 days, and it hampered navigation once or twice. Temperatures were over 80º F on perhaps a dozen days, but only the first day was blazing hot. We had ice form overnight on two nights. We consider ourselves quite fortunate with the weather and others should not count on being so lucky. 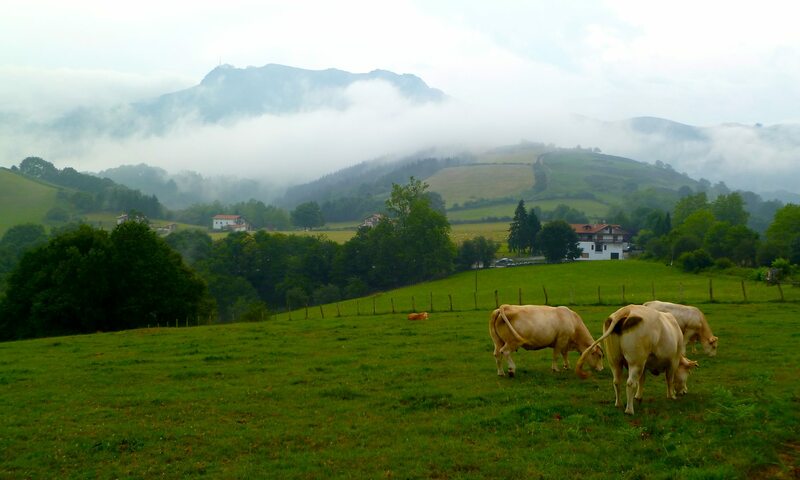 For example, we dined with two HRP’ers toward the end of the trip who reported that their first five days, in Basque country, were entirely in dense fog and they never had views. 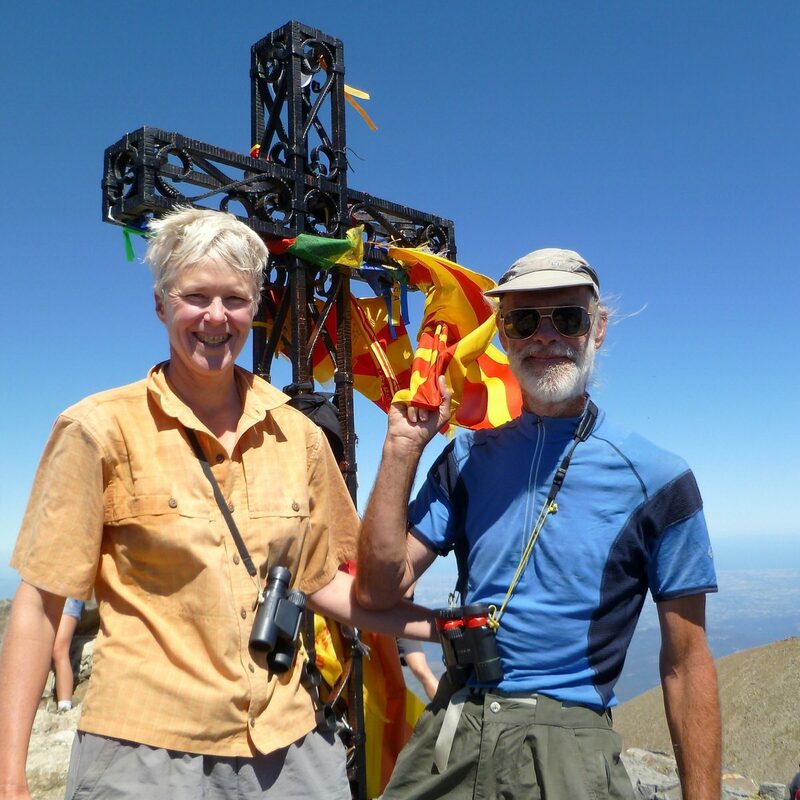 We also met a couple who had started in Hendaye before us, but after five days of extreme heat, changed plans and rented a car and drove to the higher mountains, then spent a month taking day and overnight hikes. The first day of our trip was the last day of their five day heat wave. We never had significant bug problems while hiking, although biting flies were a very occasional annoyance. We had a couple of campsites where the evening bugs were annoying enough that we ate dinner inside the tent. Amy spoke enough Spanish and French to take care of logistics, but not enough to have meaningful conversations. And, no surprise, neither of us understood Basque or Catalan, two other languages commonly spoken in the region. We didn’t have any problems taking care of logistical matters with Amy’s language skills, but it was frustrating to be unable to just converse with the non-English speaking hikers and locals we met. Many people spoke at least a bit of English, particularly at the refuges. Young people frequently spoke English, while older folks less so. 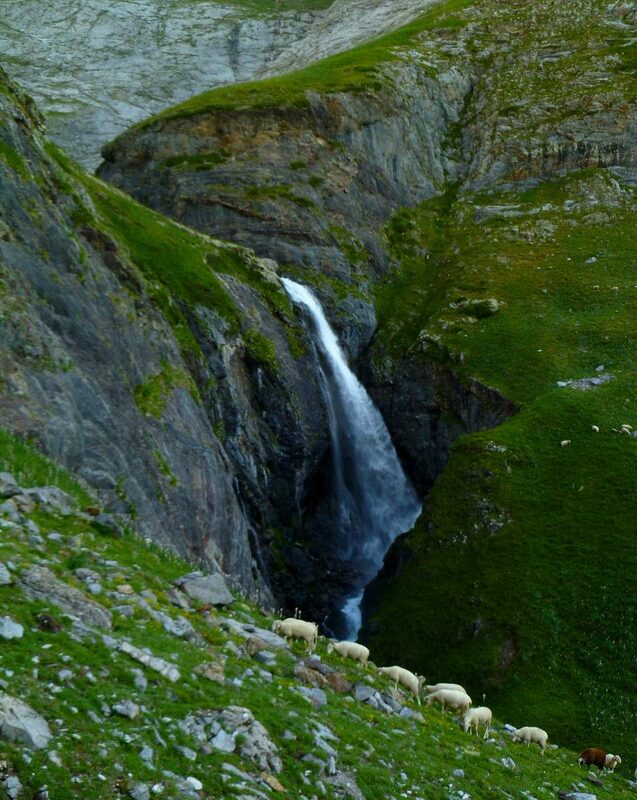 There are lots of cows, sheep and horses throughout the Pyrenees, and most of these animals wear bells. The clinking and clanking add to the ambience for some people, but keep in mind that the racket does not cease at sundown, so you might want to carry earplugs. We met at least two parties every day of the trip and on some days, we passed several dozen hiking groups. 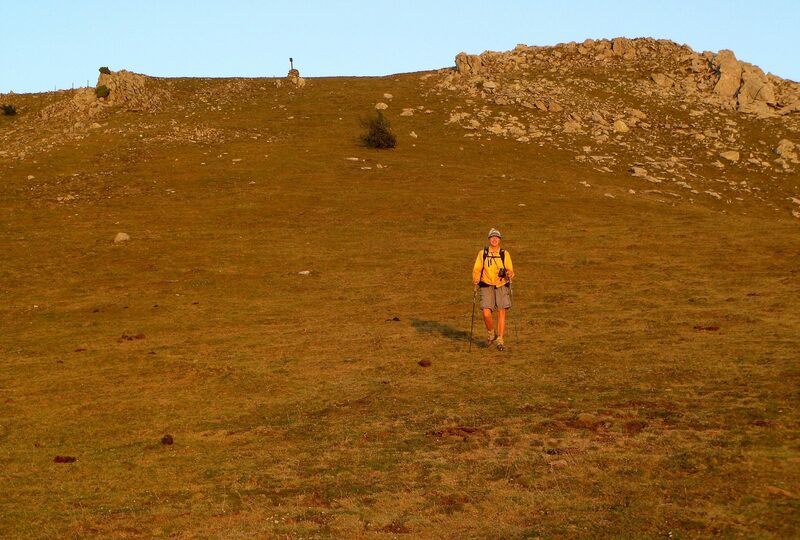 On the three-hour descent from Puig Carlit we passed literally hundreds of day-hikers. Most of the time, people were clustered near trailheads and refuges, so we often had quite long stretches without seeing other hikers. We only met four parties walking the HRP coast to coast. We saw 120 species of birds on the trip, including seven life species. Highlights included Lammergeier, an enormous vulture that had previously eluded us on three continents. Unsurprisingly, water birds were scare, but the diversity of land birds, from raptors to songbirds was quite good. 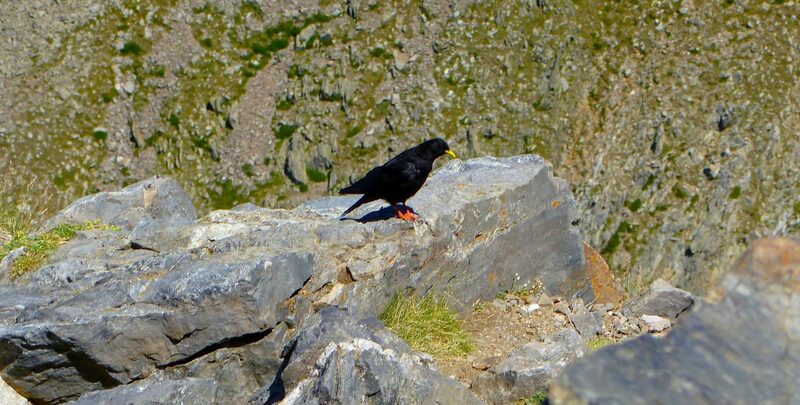 Choughs are absolutely cool mountain birds. Thank you for the information that you have covered so well including all the points that people want to ask but are too afraid to. 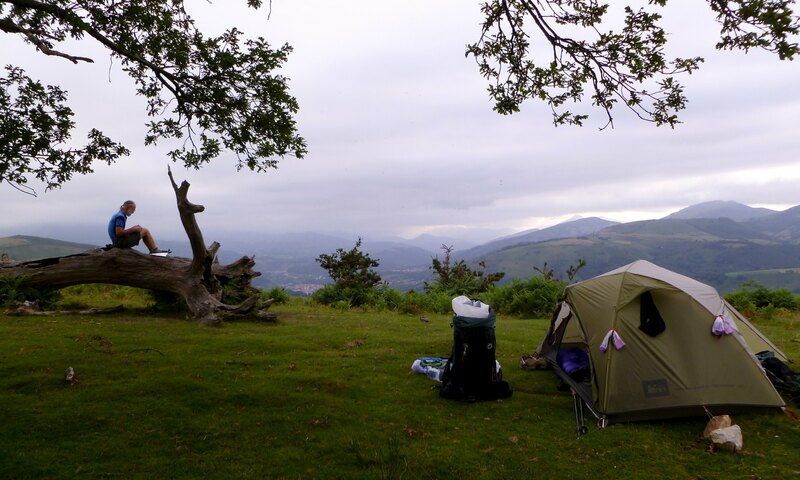 In particular I liked your comments on wild camping, food and the types of terrain to expect. Pauline from New Zealand. will be doing this trip next June. 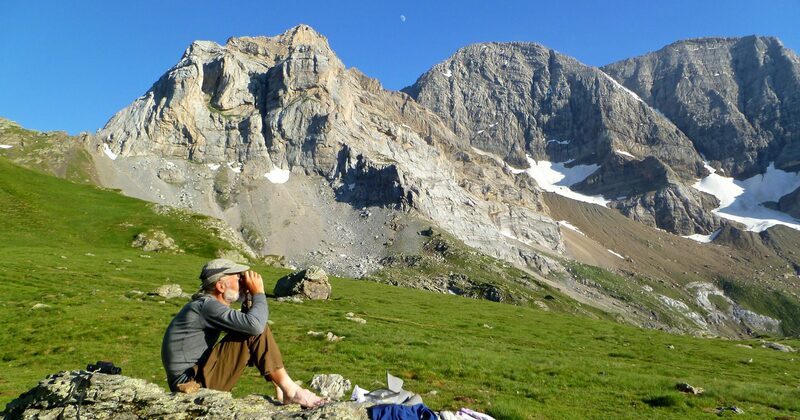 Pauline, You are likely to love hiking in the Pyrenees and we’re glad our information was useful. Have a fun and safe trip next June! What were the average night time temperatures? I ask because I’m intending to complete the whole west/east route from mid July and don’t want to buy another sleeping bag if I don’t have to. The one I have is light and has a comfort range of 39 degrees F to 28 degrees F and an extreme of 0. We never had frost. Your bag should be fine. Hi Amy & James. Firstly thank you for this post. Even after a few years, it’s still one of the best sources of info for the HRP. I’m making a printable map, as sourcing all the IGN maps is expensive and difficult. I am planning to splice together French and Spanish IGN maps. -To do this I can either use Gaia (which has the Spanish and French IGN maps), or Caltopo which uses the TF Outdoors layer. Do you have any comments on the reliablity of TF Outdoors as a navigational tool? Caltopo is far superior for printing than Gaia, but there isn’t much (any?) info about anyone doing the HRP with the caltopo map source. -You carried both French and Spanish IGN 50,000 maps. Anecdotally, I’ve heard good things about French maps and bad things about Spanish maps. The 50,000 IGN series covers a bit of the Spanish side (nearly 90% of the HRP route by my estimation). What I’m unsure about is if the French maps are still superior in quality where they cross the border? If so I can just splice the Spanish maps in where the French maps won’t cover the route, but if not, I will splice down the border. Anon: Are you planning to carry a smartphone with Gaia GPS and/or iPhiGeNie (http://xn--iphignie-f1a.com/)? If so, then printed maps using CalTopo and TF Outdoors should be fine. If you’re not using a smartphone as a GPS device, then it might be worth printing maps that use the IGN maps, but I’d have to study both sources to see which one has a clearer presentation of the relevant data to form an opinion about which would be more useful. As you probably know, TF Outdoors and OpenCycleMap and Gaia’s own layers are all based on the OpenStreetMap project. That is a wiki-style map of the world, in which users can add and edit data. We have found that some things shown as trails OpenStreetMap are marginal use paths, so be forewarned. On the other hand, TF Outdoors labels the GR10, the GR11, and some version of the HRP with variants. Thanks for that. From looking closely at them, it’s hard to say which is more useful. I find the IGN maps easier to read, but the OSM/TF maps do give different info. I do have the Gaia IGN set, but last time I decided to test my phone as a navigational tool, the battery would fail in cooler more humid conditions (but nothing extreme, maybe 10 degrees on a day with on-off drizzle, not dense mist) which was really concerning. 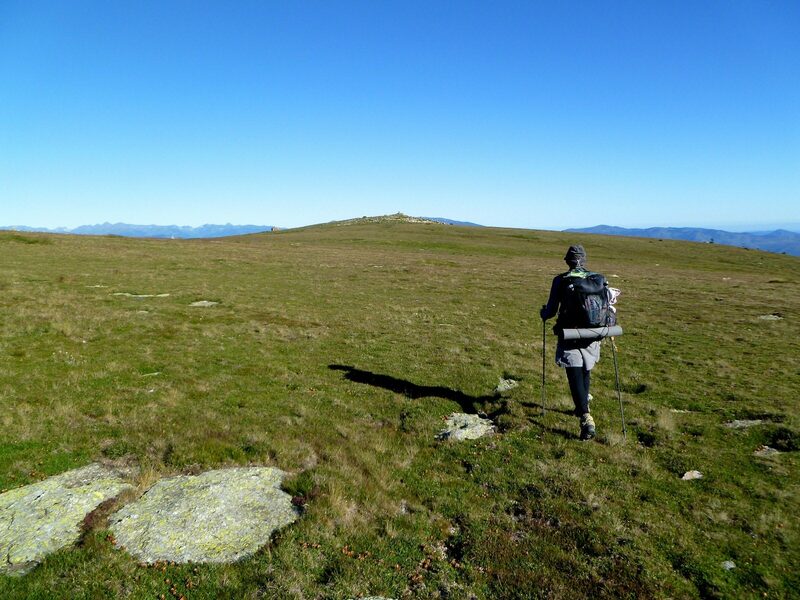 The kind of conditions you would expect fairly frequently on an outdoor hike, and the kinds of conditions you might most need reliable navigational tools. The ideal would’ve been to print the 50,000 IGN set, or the TF outdoor set, and have the phone for a closer 25,000 view. But I think I’ll need to be able to rely entirely on paper, and if my phone works out it’s a nice secondary tool. Roger, Thanks for your note. 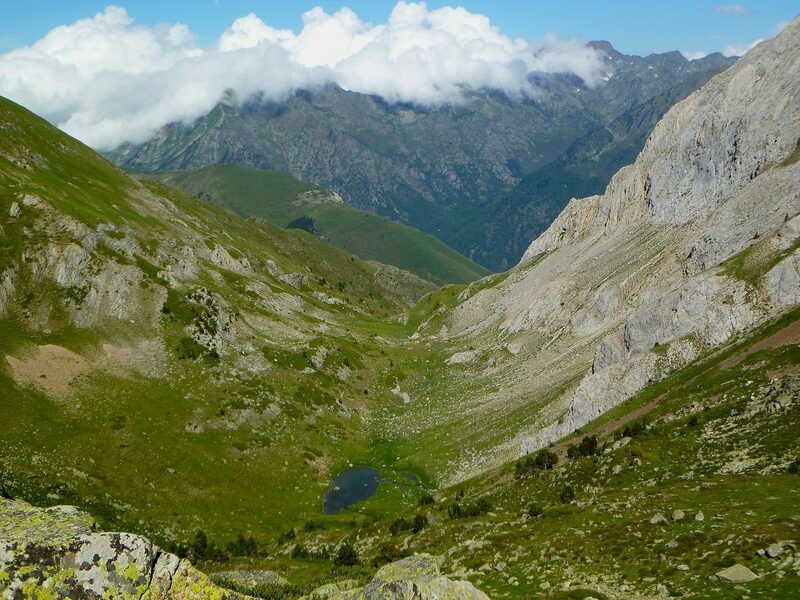 We look forward to returning to the Pyrenees and possibly following some variation of Veron’s route. Thank you so much for letting us know about your trip. Glad to hear you enjoyed yours as much as we enjoyed ours, and happy to hear that our report proved to be of some use. Thanks a lot for the information on your site. We are planning to do 10days of hiking this summer. Which part of the stretch would you recommend most in 10 days? Sorry for the delayed response; we were out traveling. We enjoyed the scenery every day of the route. So we have no preference for which section is “best”. 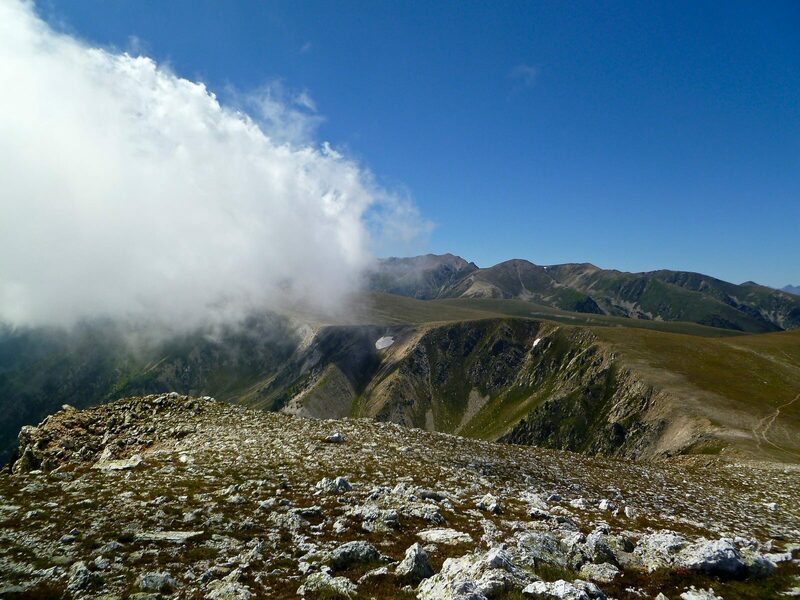 If you are hiking during the summer, then we recommend any of the higher altitude areas in the middle of the hike, as it is hot in the lower eastern and western sections. If you are hiking in the spring or autumn, then we recommend starting at either coast so that you can pick up where you left off in future years when you return to complete the HRP. Good luck, and enjoy your hike. thank you so much for your thoughtful, well put-together blog! it’s such a pleasure to read and gather information as we plan our adventures in france and spain this summer. we appreciate it so much! Thanks for letting us know that it helps you!